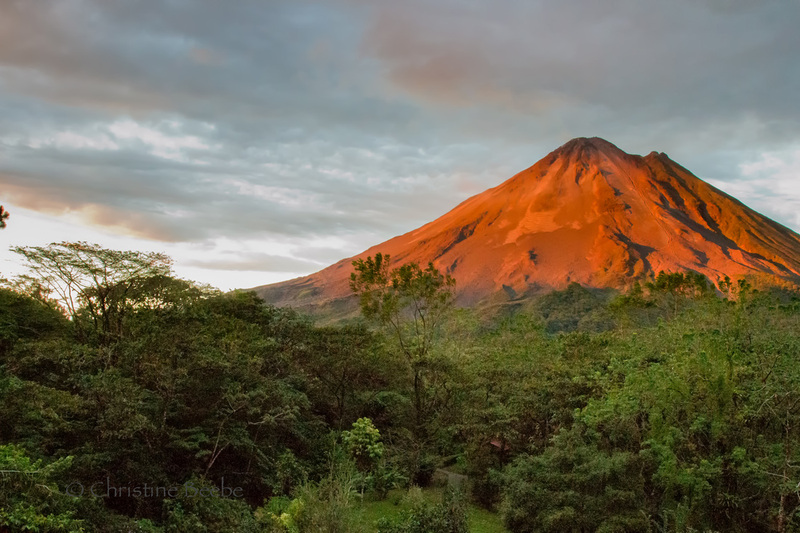 Costa Rica is a small country about the size of West Virginia, with an astonishing diversity of wildlife: five percent of all known species on earth live here. 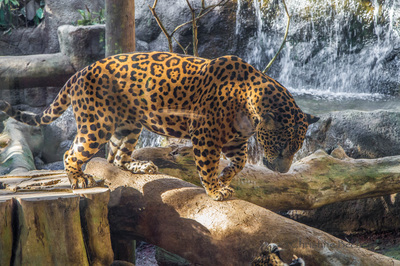 Situated just north of Panama, Costa Rica is where the continents of North and South America shake hands via a land bridge between two vast oceans, and it's where creatures from both land masses have come together over millennia. 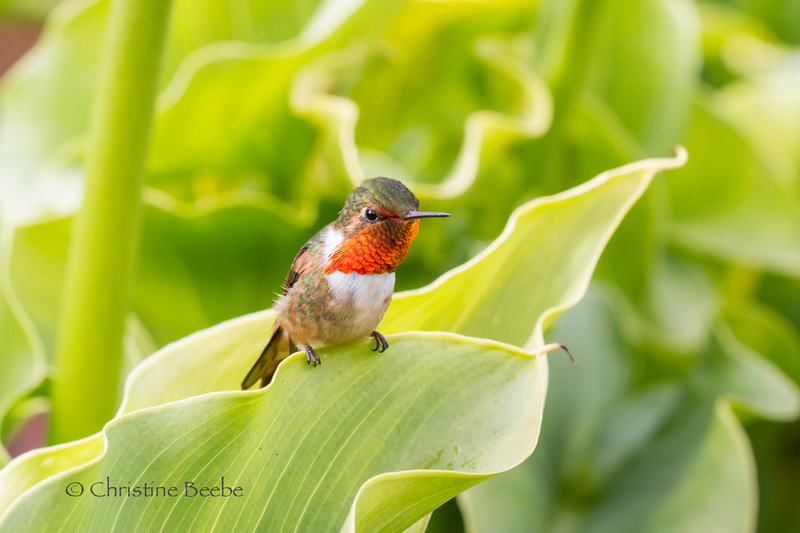 Many species from the north never migrated further south, and many from the south haven't ventured further north. 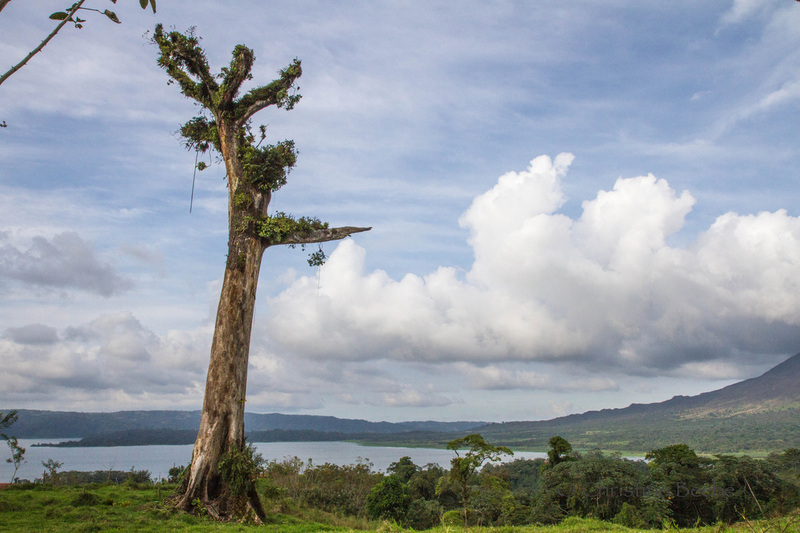 Thus, this rich land boasts a variety of animal species seen in few other places on earth. 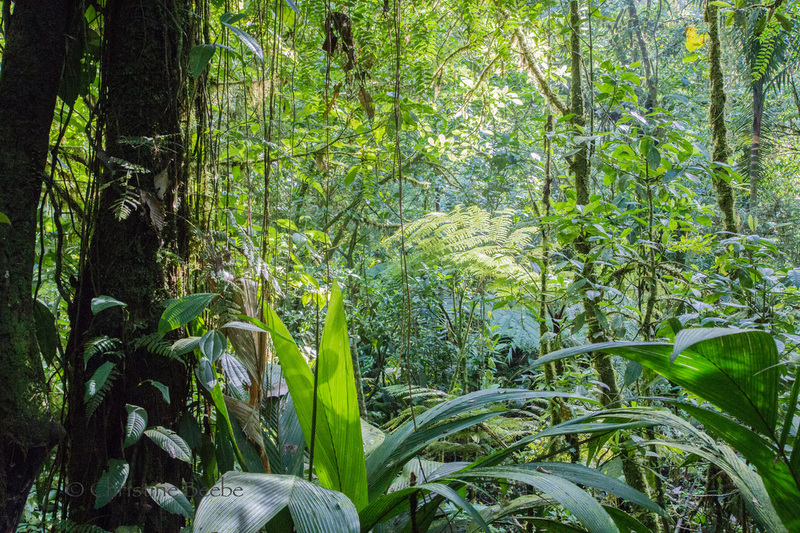 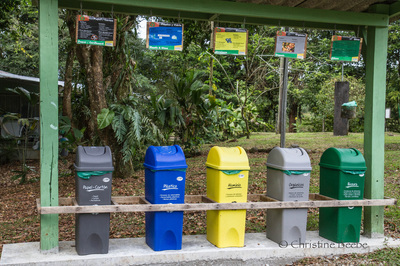 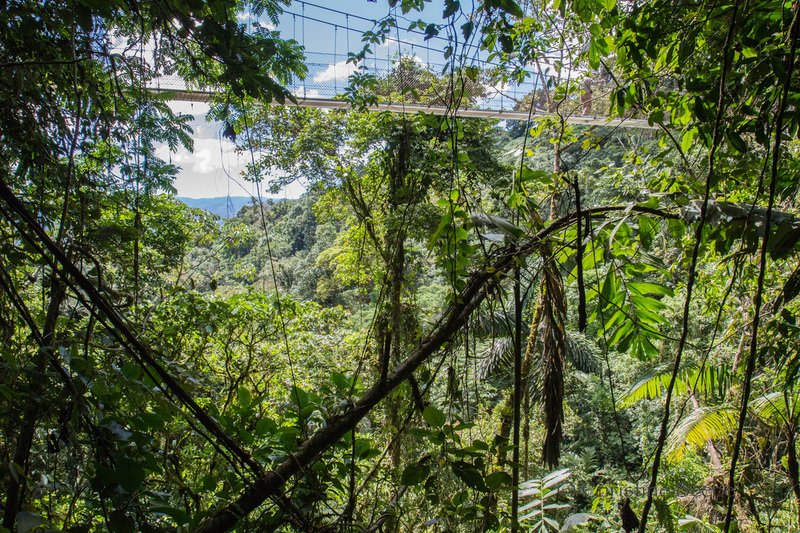 Costa Ricans are proactive and serious about protecting their natural resources; 25% of the country is now protected in wildlife preserves or national parks. 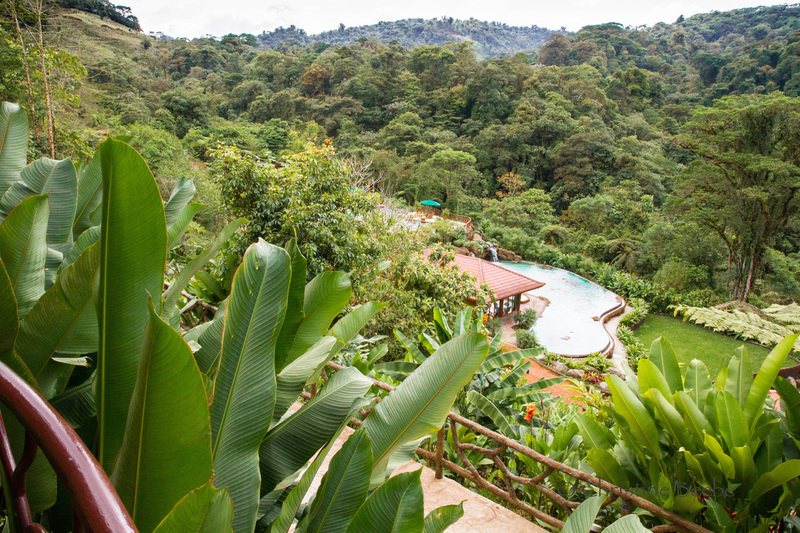 It's a pure haven for nature lovers. 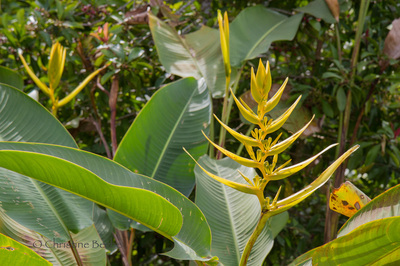 Lush plants grow rampantly and abundantly here, and other plants are growing on those plants. Small creatures eat the plants, and big creatures eat the small creatures. 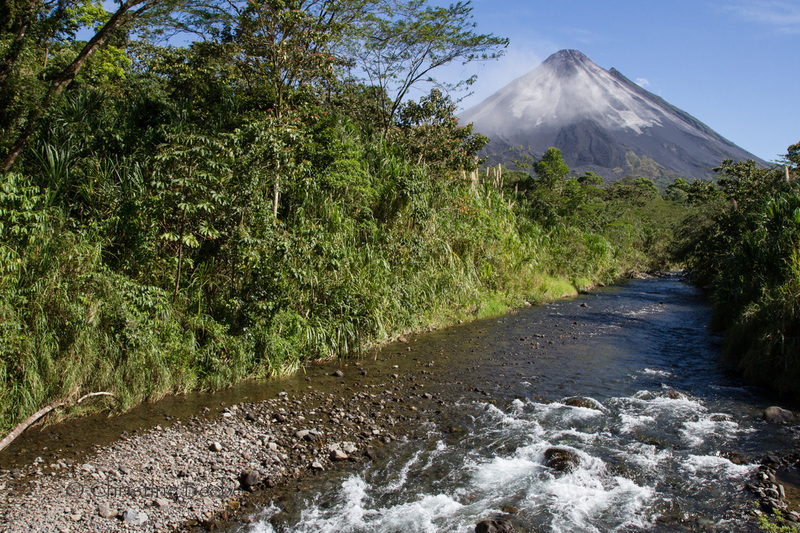 Rivers run, waterfalls rush, volcanoes spew, and waves crash on beaches. This place is a modern-day Garden of Eden. 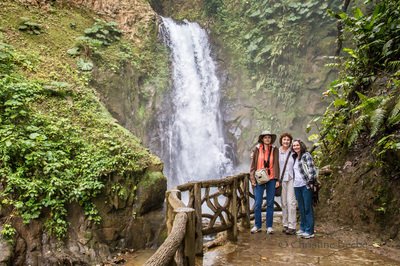 My companions on this 2-week trip in 2011 were my daughter Jessica and my friend Julie. 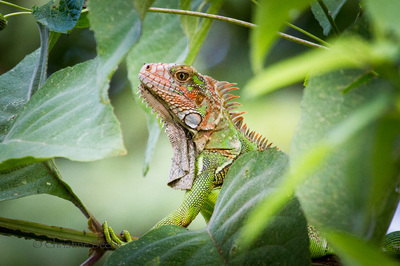 Our first 10 days were part of a small private bird watching tour with an excellent Costa Rican owner-operated company called Tropical Feathers. At the end of our tour, we three ventured out on our own to see two very special destinations that were not to be missed. 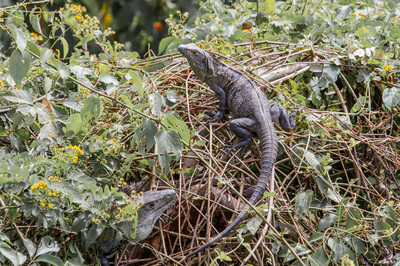 We saw incredible birds representing hundreds of different species, and also many of the snakes, frogs, mammals, and breathtaking scenery that Costa Rica is noted for. Below are photos and insights, with trip details at the end of this section. 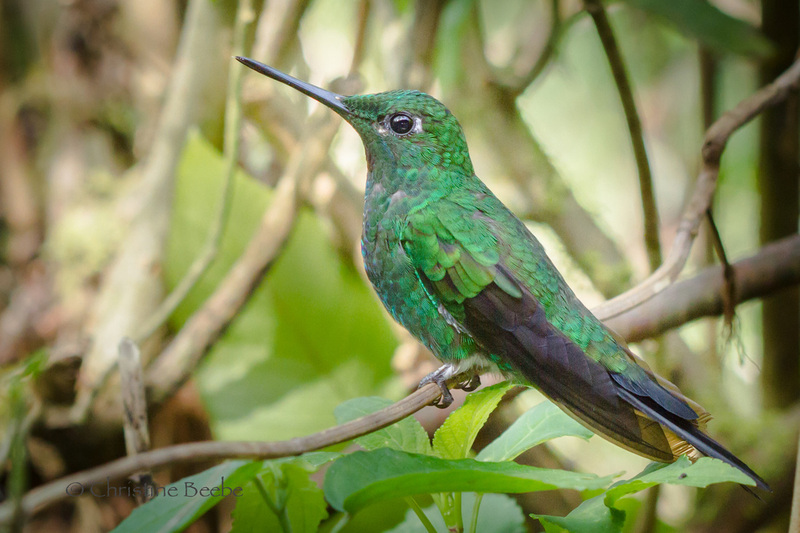 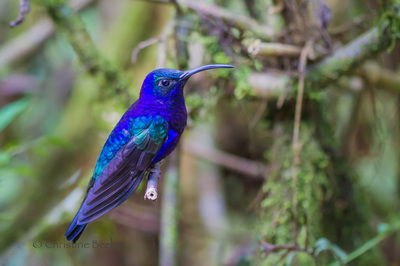 Hummingbirds live only in the New World, and Costa Rica is home to some 50 species. These fascinating birds are the world's smallest, yet proportionately they have the largest hearts and brains of any animal. 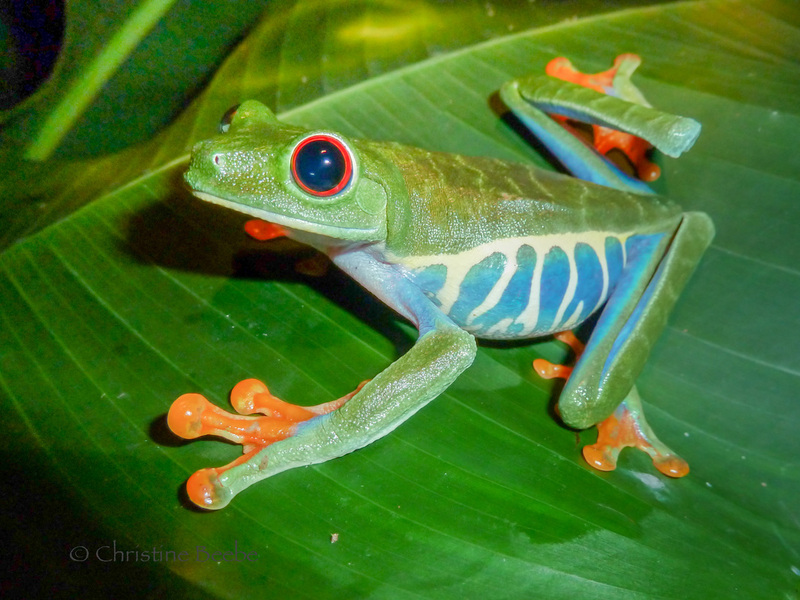 Their hearts beat 500-1,200 times per minute. 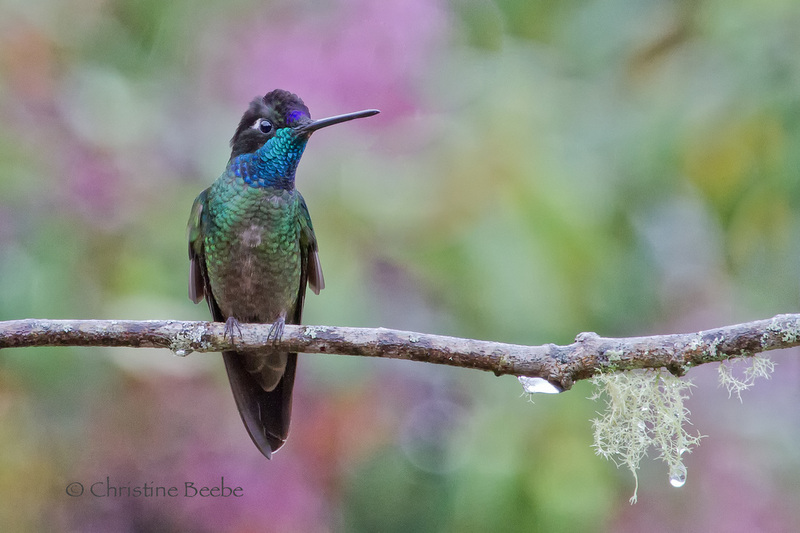 We saw 13 different hummingbird species, each astonishing in its beauty and diversity. 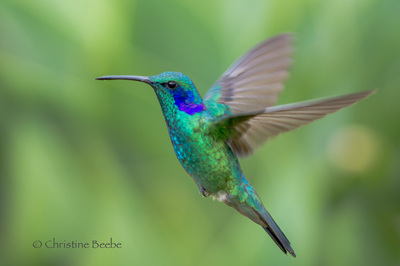 The aerial acrobatics exhibited by these little birds are unmatched by any other creature. 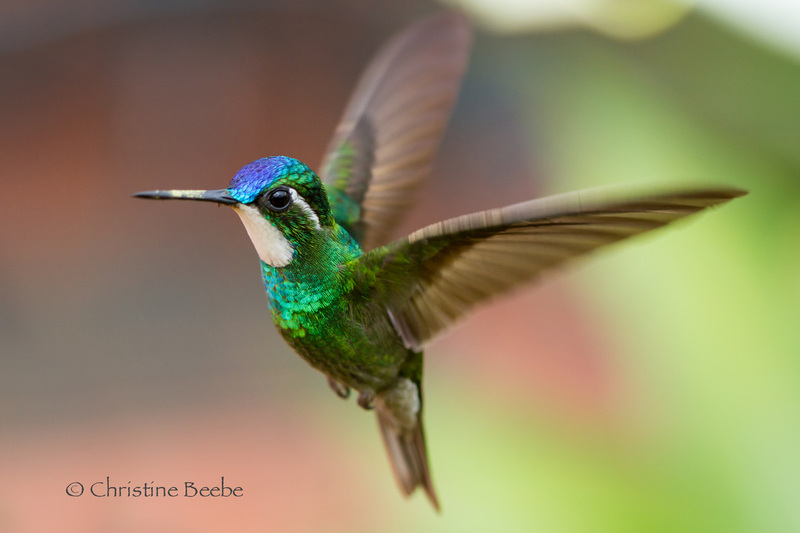 They can fly 45 miles per hour, hover in midair, fly backwards, and their little wings beat from 40 to 90 times per second. Capturing a photographic image of an airborne Hummer requires a steady hand, a sharp lens, a fast shutter speed, and lots of patience! 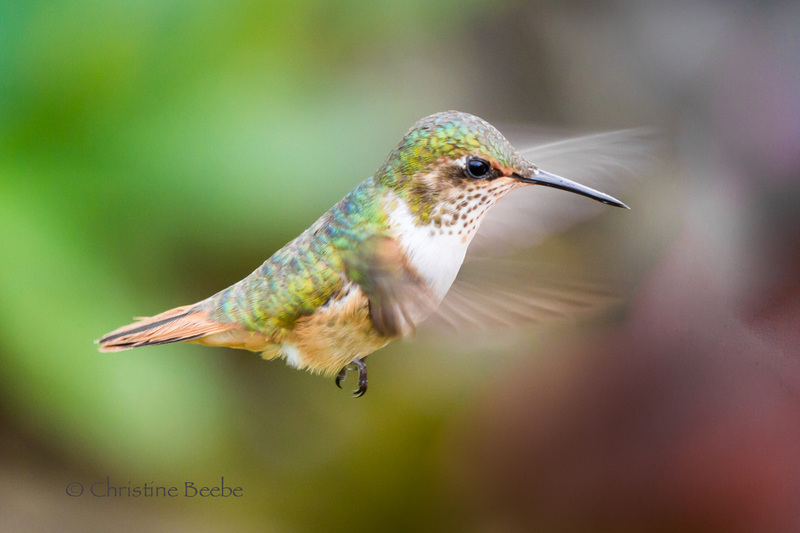 Hummers rotate their wings in a figure-eight pattern when they’re hovering in place, and you can glimpse the faint pattern of this motion in a few of the photos below. 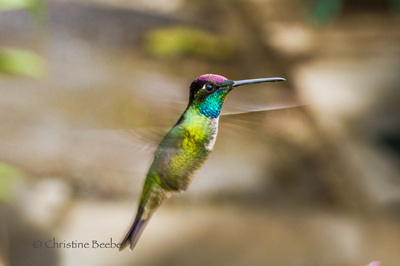 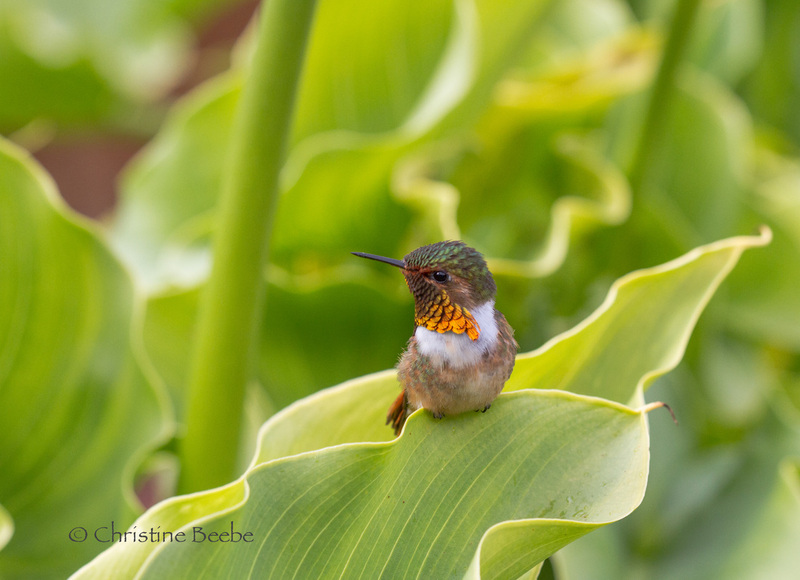 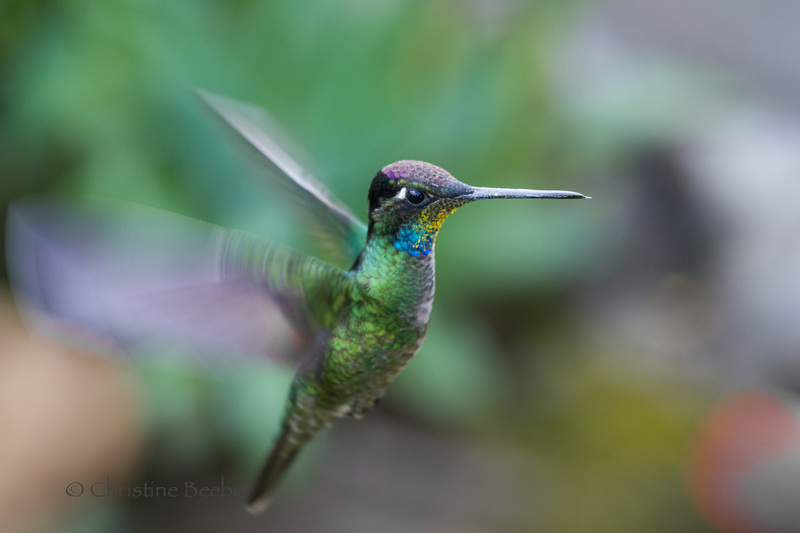 Hummers' jewel-like colors come not from pigment, but from tiny iridescent prisms in their feathers. To impress females or challenge intruders, males raise the feathers at their throats or elsewhere to reflect light with a dazzling flash of color. On the far left is a Volcano Hummingbird, and you can see a bit of golden color on his throat "gorget" feathers. Move to the right photo to see the same bird with his now brilliant orange gorget angled into the sun. 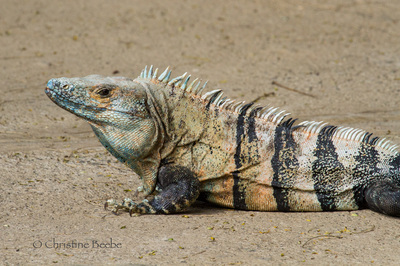 He's about to charge a male competitor. 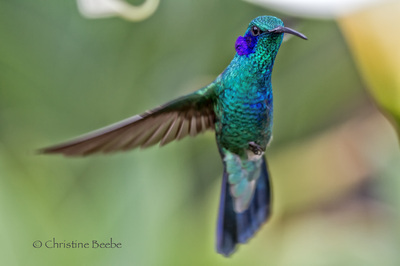 Hummingbirds consume twice their weight in nectar daily, and to do so they visit up to 5,000 flowers per day. Many have developed physical qualities that allow specialized access to their flower of choice. 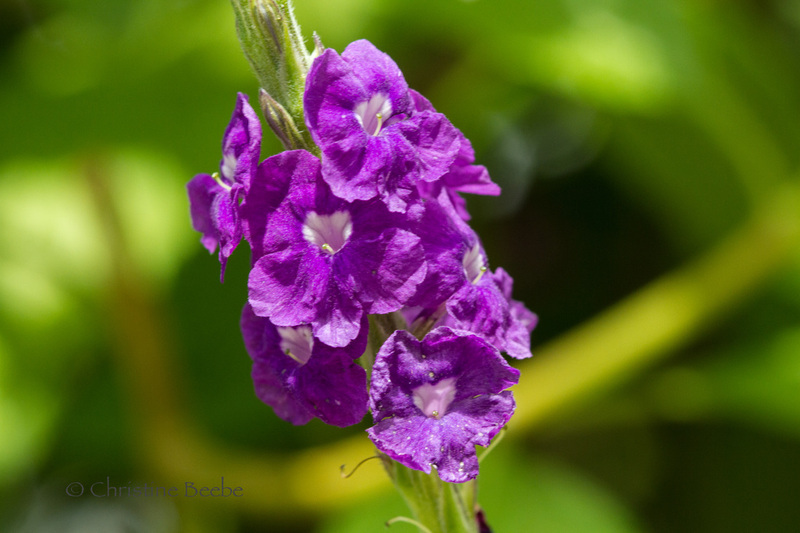 Violet Sabrewings, in the photos below, have long curved beaks that fit perfectly within the deep caverns of banana blossoms. 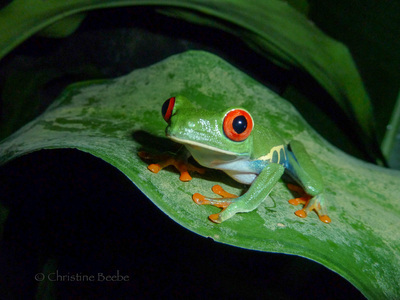 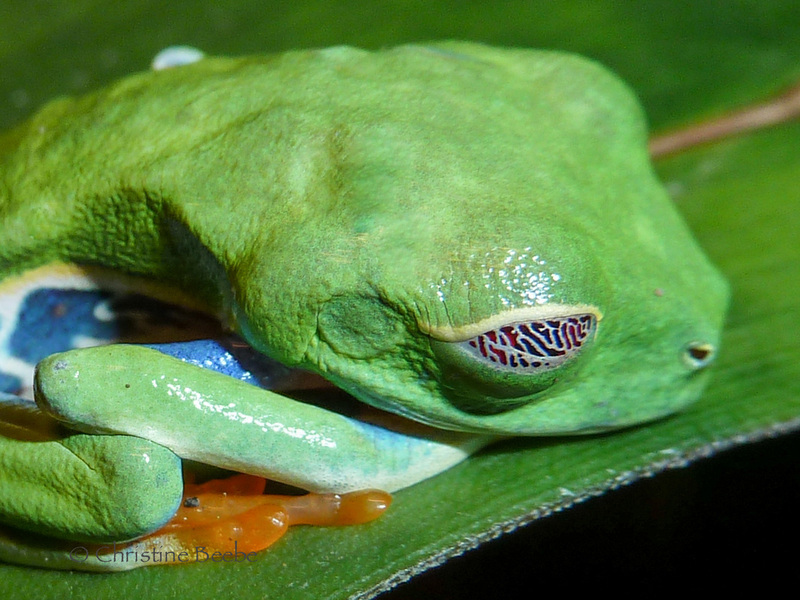 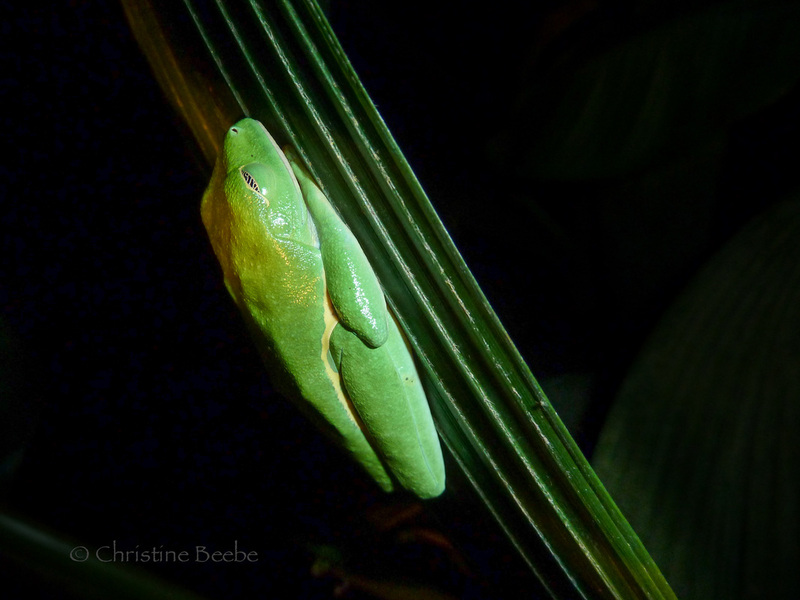 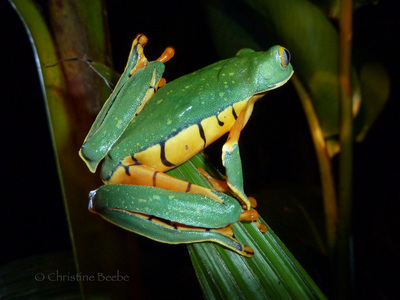 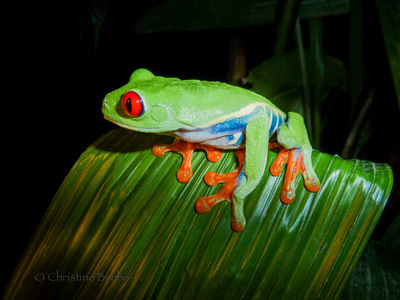 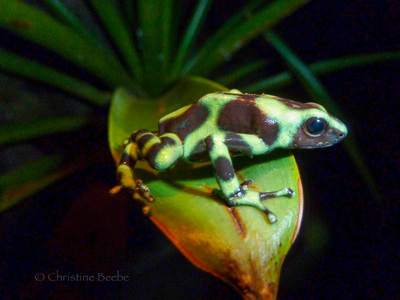 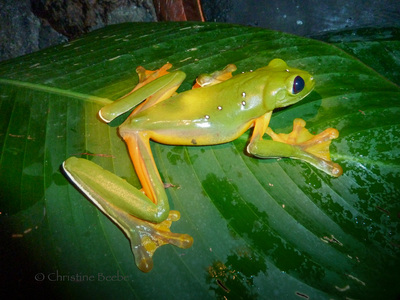 It's easy to become enchanted with Costa Rica's iconic tree frogs, even when you know many are poisonous. 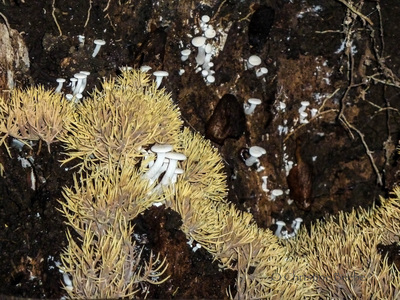 Their tiny size (under 2 inches), brilliant colors, bendy-floppy legs and sticky feet, not to mention their goofy big-eyed expressions, make it well worth venturing out into the humid nighttime to see. Giant Parrot Snake at La Paz Waterfall Gardens. 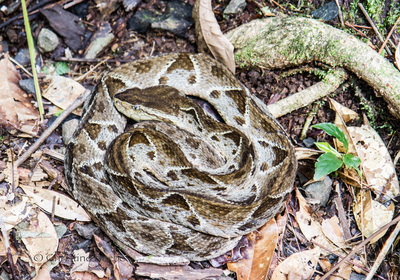 Of the 137 species of snakes in Costa Rica, 22 are extremely venomous. 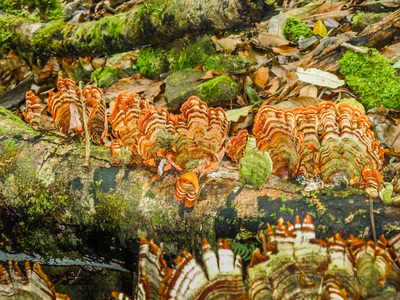 Fifty-five species have their northern or southern limits in this country, and 13 species are found nowhere else on earth. The most dangerous and aggressive snake is the Fer de Lance, which accounts for 90% of snakebites in Costa Rica. 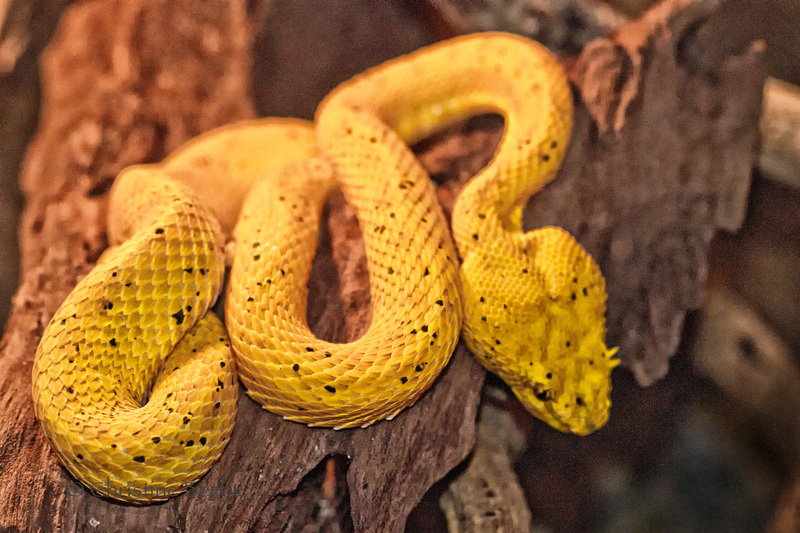 Its lethal venom dissolves nerve tissue and destroys blood cells. 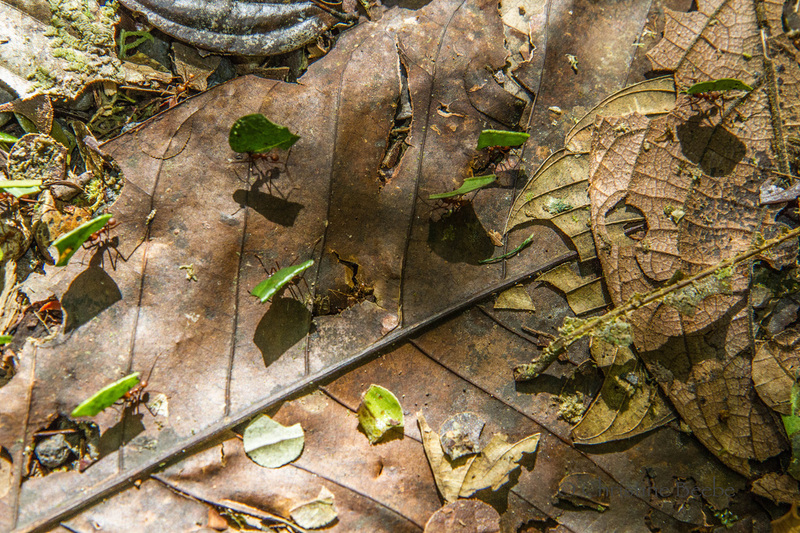 A night hunter, it coils itself on the ground during the day – which is where we encountered it mere inches from our jungle trail, staring back at us with its glassy eye. It was so well camouflaged among the leaf litter, several in our group walked right by without seeing it. 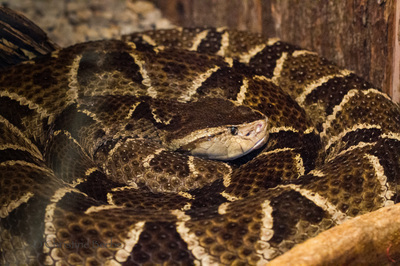 Below is a photo of the one we saw, along with another from a serpentarium we visited later in the trip. Another lethal snake we encountered alongside a trail was the Eyelash Pit Viper, named for the protrusions above the eyes. 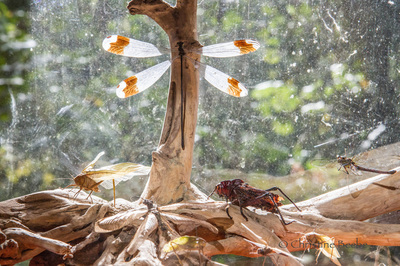 Again, a photo of the one we saw and another of one safely behind glass. 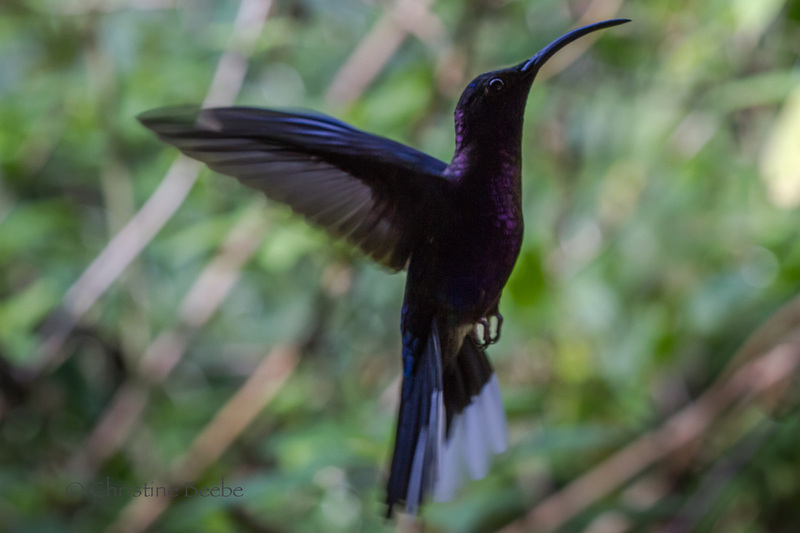 I won’t apologize for the first being out-of-focus: at the time, it just wasn’t a good idea to hang around composing a shot within striking range. 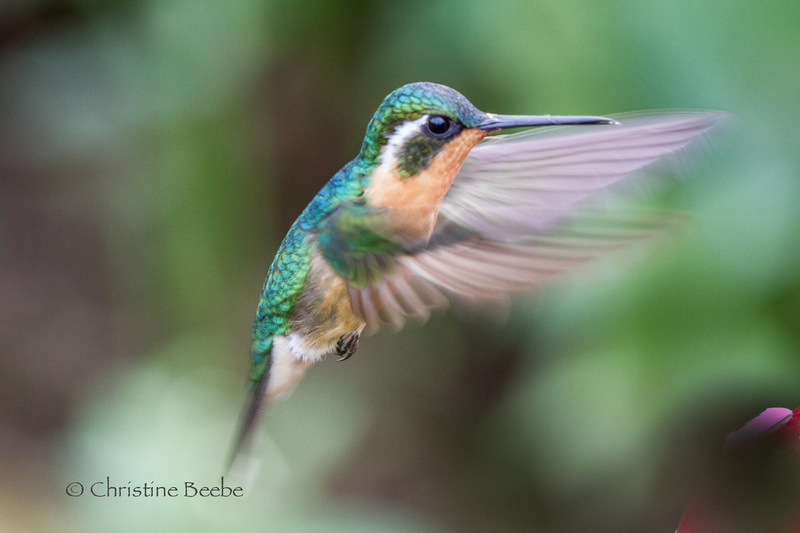 I'm in awe of nature photographers, especially those who capture great photos of birds. 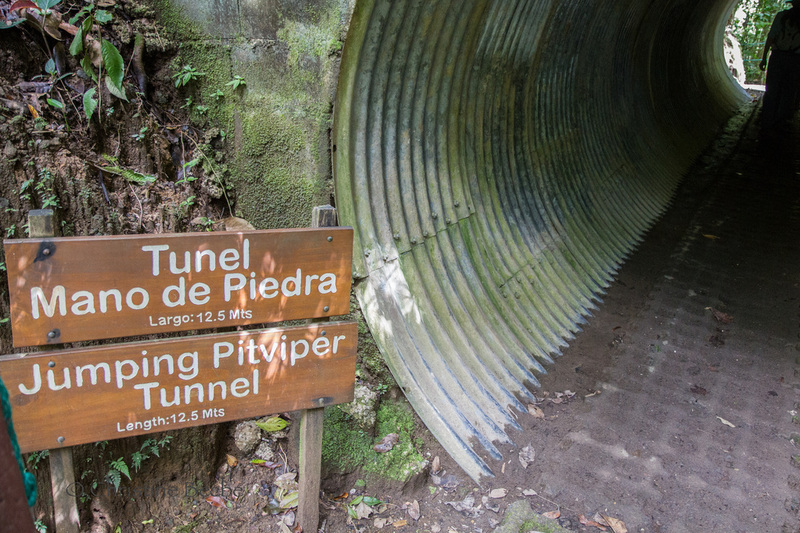 It's not an easy task. 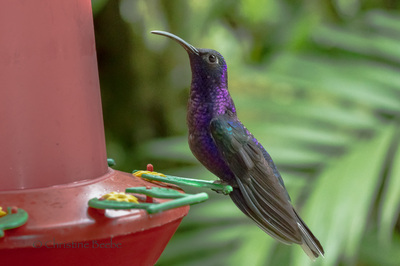 You might think that after spending two weeks in Costa Rica, looking at birds from before sunrise to after dark every day, I'd have hundreds of great bird photos to post. 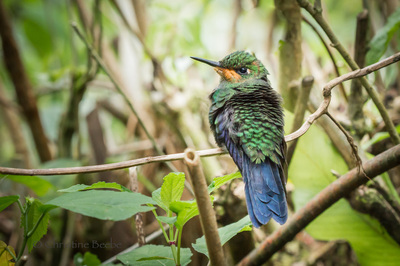 After all, it didn't rain too much, and I was using a perfectly adequate Canon SLR camera with a variety of excellent lenses. 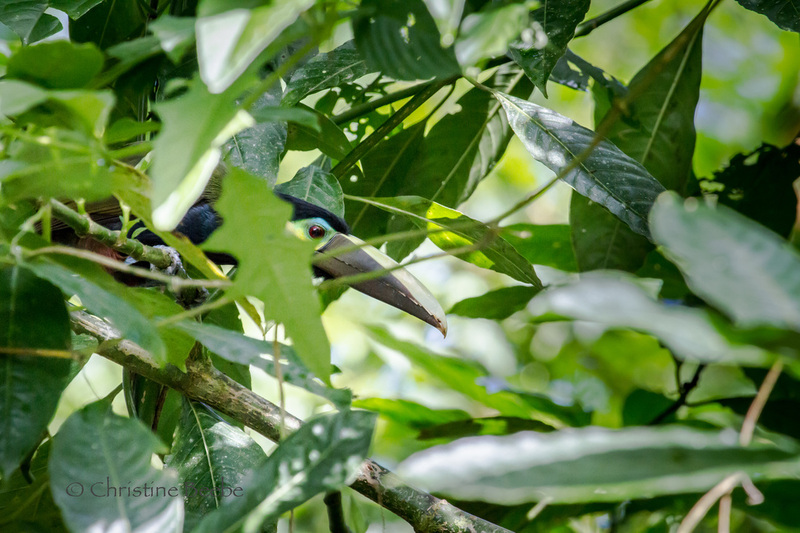 What I discovered was this: birds in the tropics live in trees - thick wet jungly trees with lots of leaves and branches - and birds like to hide among them. 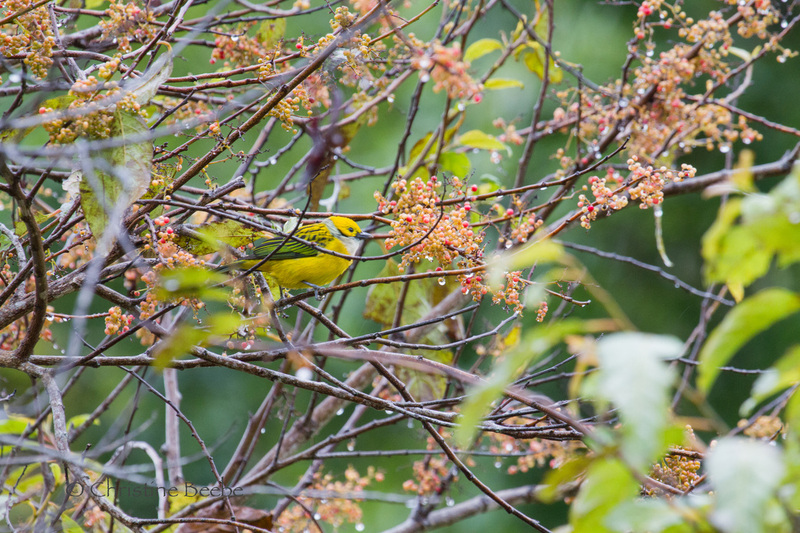 So I often ended up with twigs and fronds in sharp focus and my subject a disappointing out-of-focus smudge. 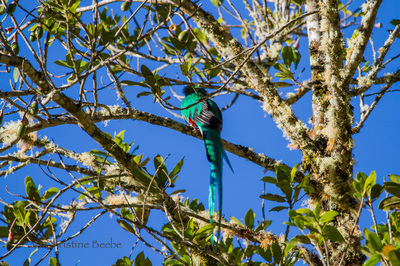 Also, birds like to perch high up in their trees, and when one does decide to hop out onto an exposed branch, you're usually shooting straight up into the glare of the sky which results in a backlit bird against a too-bright background. 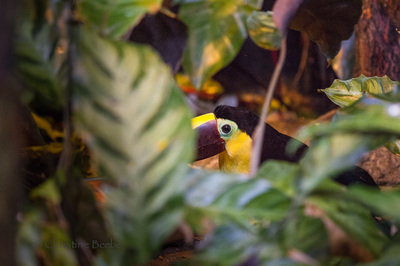 Below are four of my "less-than-National-Geographic-quality" photos: a Toucan and a Toucanette playing "Where's Waldo" among the leaves, a Tanager "bird in the bush", and a Resplendent Quetzal (the gorgeous bird that some birdwatchers come from distant parts of the globe specifically to see) who refused to turn around for an entire hour while I squinted at him through my viewfinder and waited). Below is a slideshow of some of the more cooperative birds I saw. You get up before dawn so you can drag yourself to the right place to greet the day as your new feathered friends begin to emerge. 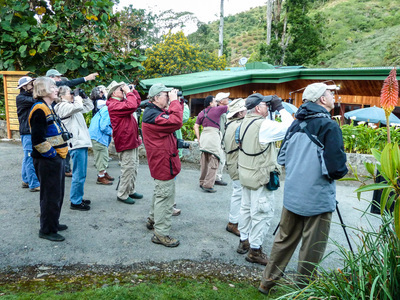 You bring your binoculars, a spotting scope if you have one, and your Sibley bird book to help you identify species. 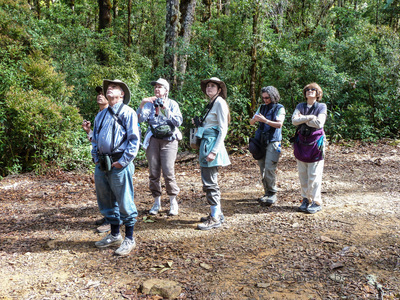 You stand with your group in one place while your guide helps you look for birds. Much of the time, you're looking straight up into the trees. No coffee is available here. You realize that most birds are very small and they like to hide in very thick foliage. 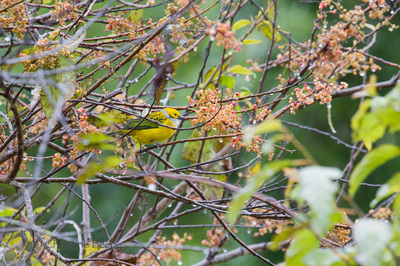 If a bird is seen by someone, you exclaim appreciatively with a hushed voice and offer useful comments like: "I think that must be a juvenile female taffy-tufted titmouse, judging from her coloration that's more drab than the adult male of the species." 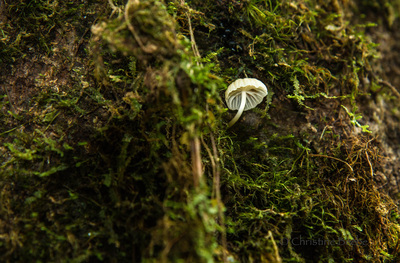 You continue to stand in that one place looking up for another hour or two. 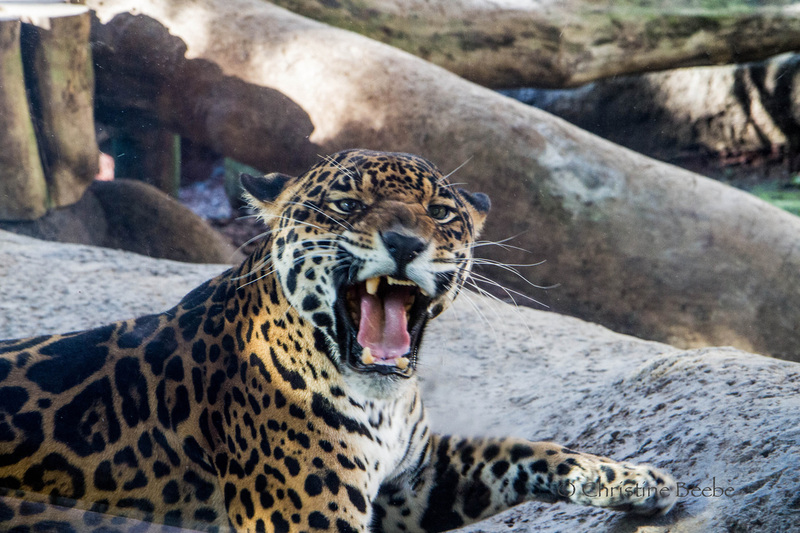 Your neck starts to hurt. You really wish coffee was available. 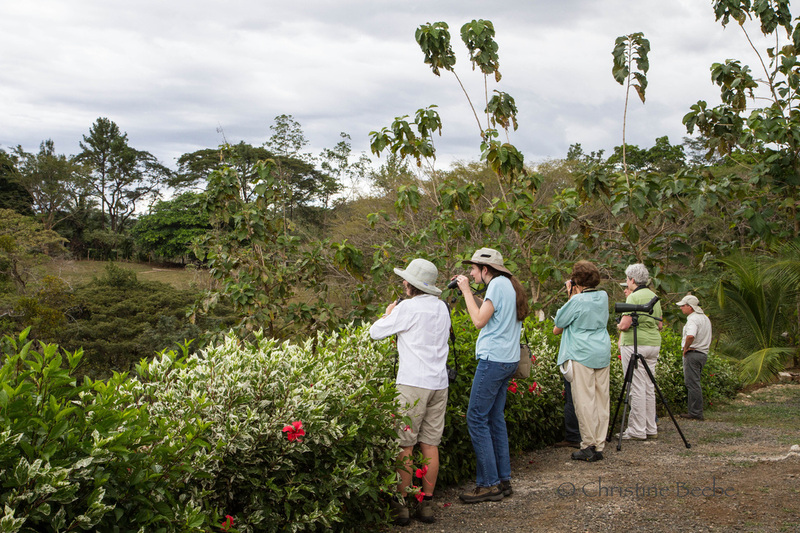 Sometimes you move to a new location to try to see more birds. You return to your lodge at noon for lunch and a shower. In the afternoon, you go to another place and stand around looking for more birds. After sunset you go back to your lodge for dinner, but sometimes the lodge has to keep your dinner warm until quite late - because the group is just having too much fun birding to return at the scheduled time. After dinner, just about the time you'd like to go to your room, take some Advil for your aching neck, and relax with a good book, the group begins the serious business of documenting the day's bird discoveries (this takes an hour or two). 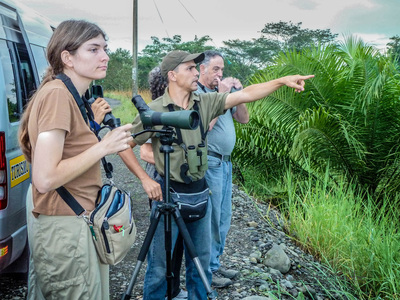 Multi-page documents are pulled out, listing the names of all birds one might see in Costa Rica, along with check boxes. There's an animated discussion about who saw what and where. 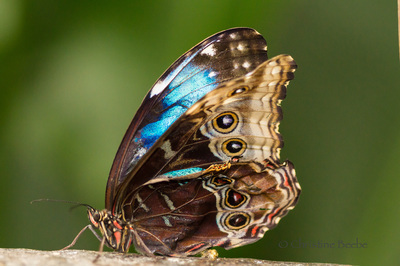 Was it a male or a female? 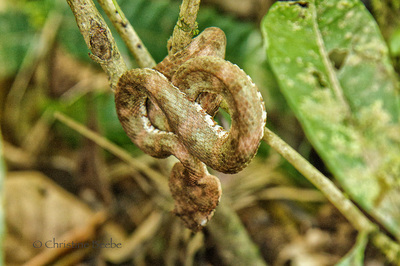 Juvenile or adult? 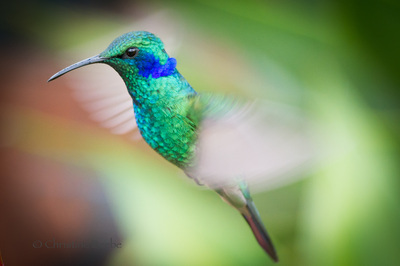 Did you really see it or merely hear its song? 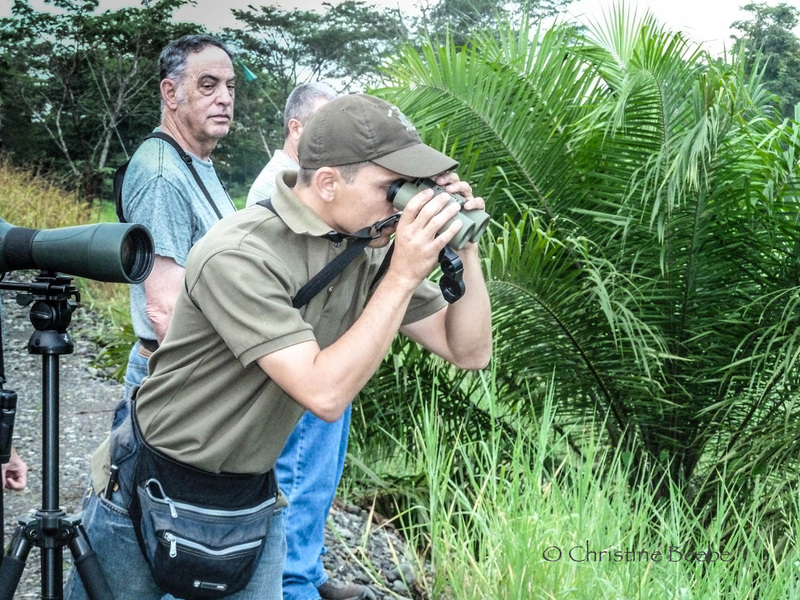 Was it a Band-Backed Wren or a Black-Bellied Wren? 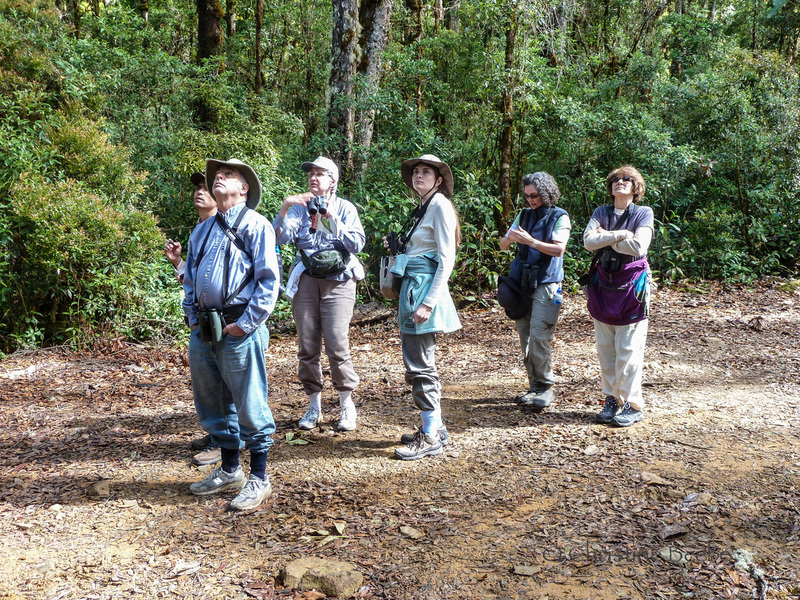 And THEN, the group heads back out into the night with flashlights to try to spot owls and other nocturnal birds. 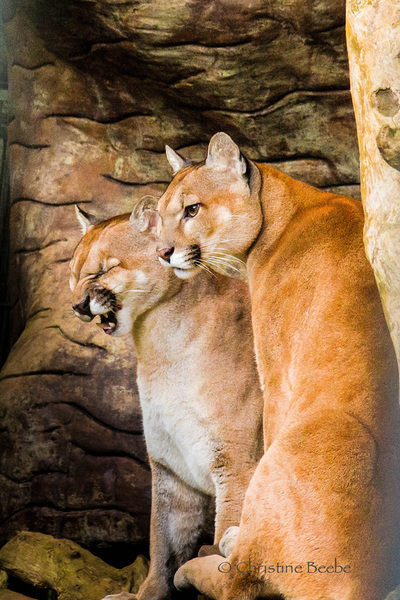 I have no idea what they saw because I was comatose in my bed. 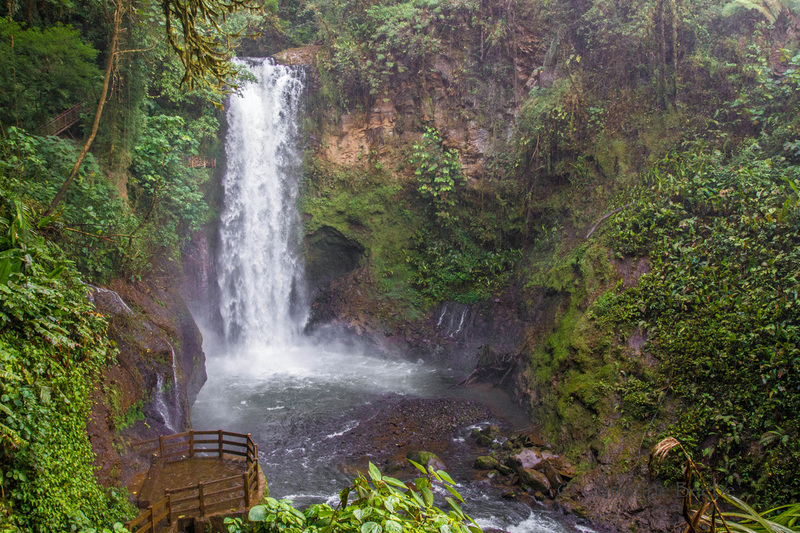 Just 175 miles wide by 300 miles long, Costa Rica offers a wide variety of climates, terrains and spectacular landscapes, including steamy tropical lowlands, white sandy beaches, temperate plateaus, as well as cool forested mountains. 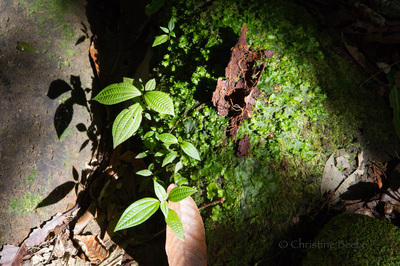 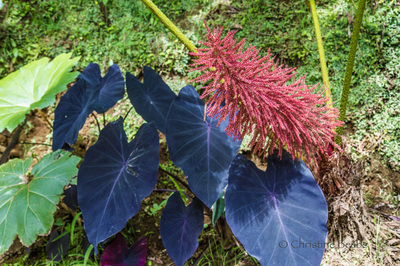 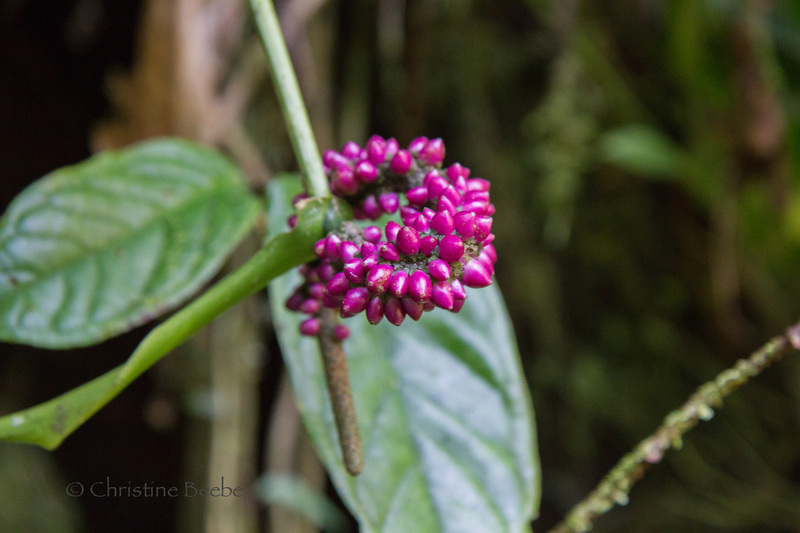 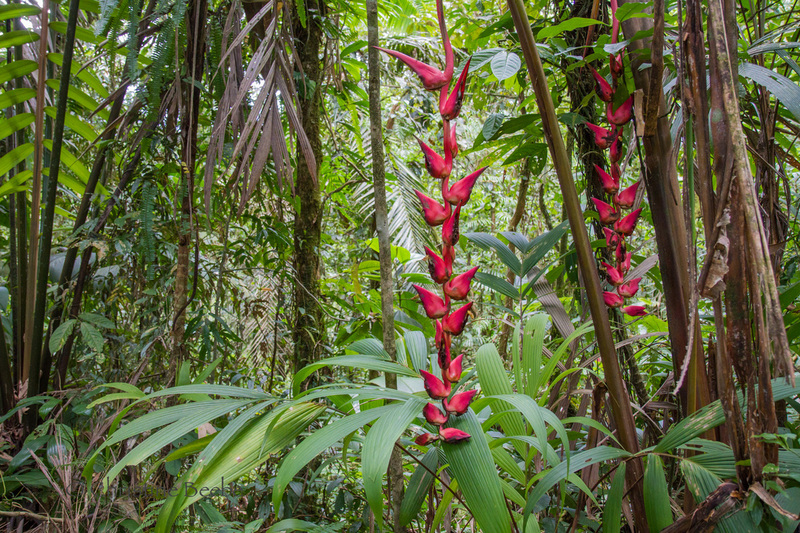 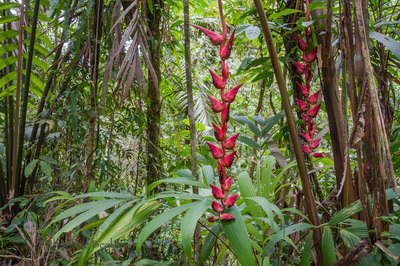 Lush rain forests and beautiful flowers are abundant. 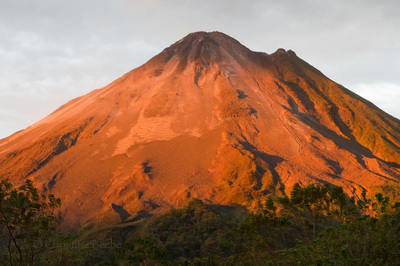 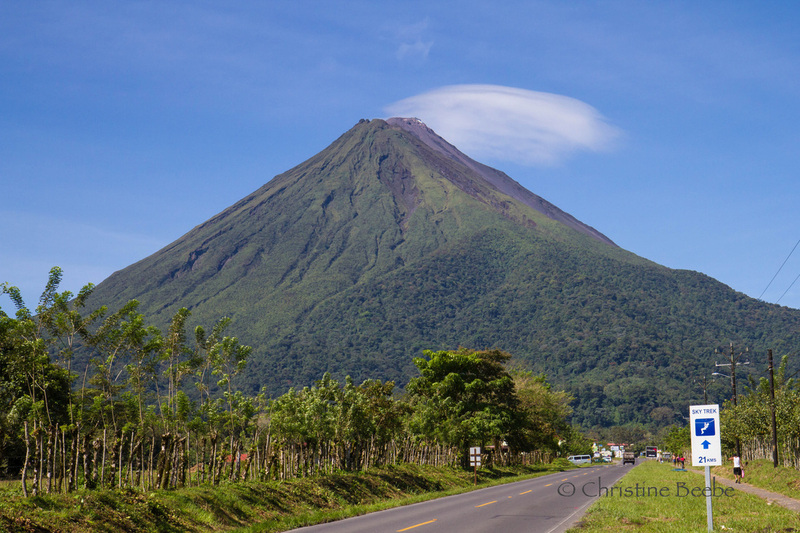 Of the seven active volcanoes in Costa Rica, Arenal Volcano erupts most frequently. It's a spectacular sight from any angle, with clouds of smoke and ash frequently puffing from the top. Our first glimpse was on a four hour ride from Braulio Carillo National Park to the town of La Fortuna, where we picked up our Suzuki stick shift 4x4 rental car. 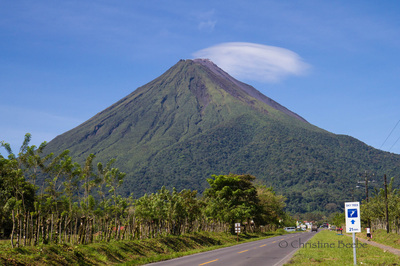 The volcano was draped with a lush green cloak on one side, but driving around it to where our lodge was located revealed barren slopes where more recent eruptions had taken place. We found our lodge down a 9 km rocky road, its bungalows built into a hillside with postcard-perfect views of the volcano in the near distance. 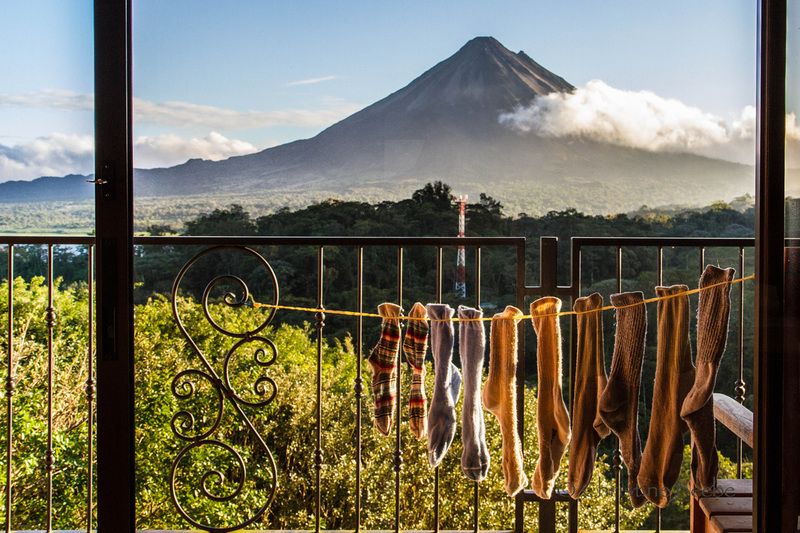 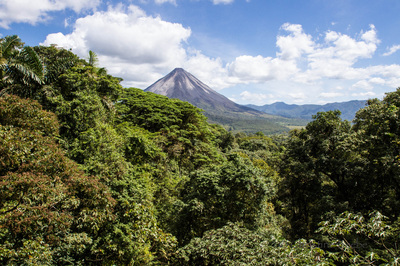 This 27,000-acre national park features the Arenal Observatory Lodge, built in 1987 as a Smithsonian Institute scientific research station (mobbed by scientists when there's an eruption); it's situated just over a mile from the volcano. 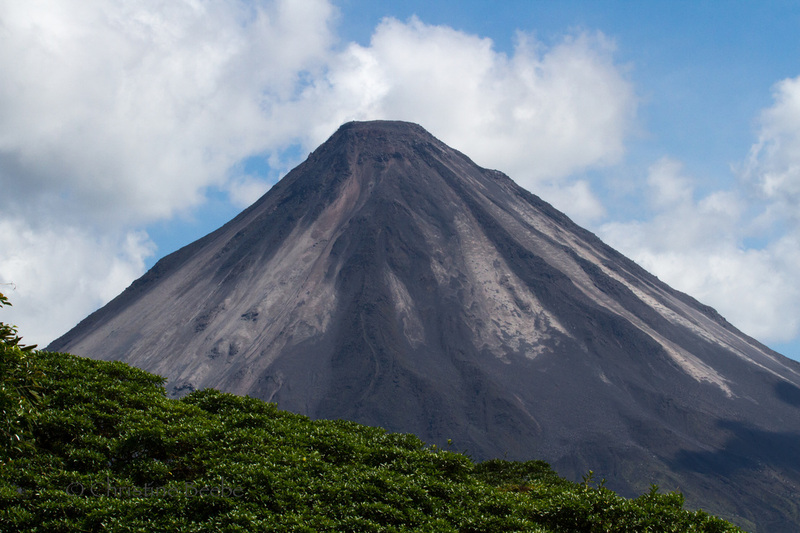 There's also a volcano museum and trails nearby, and it's a great place to observe this magnificent sleeping beast. 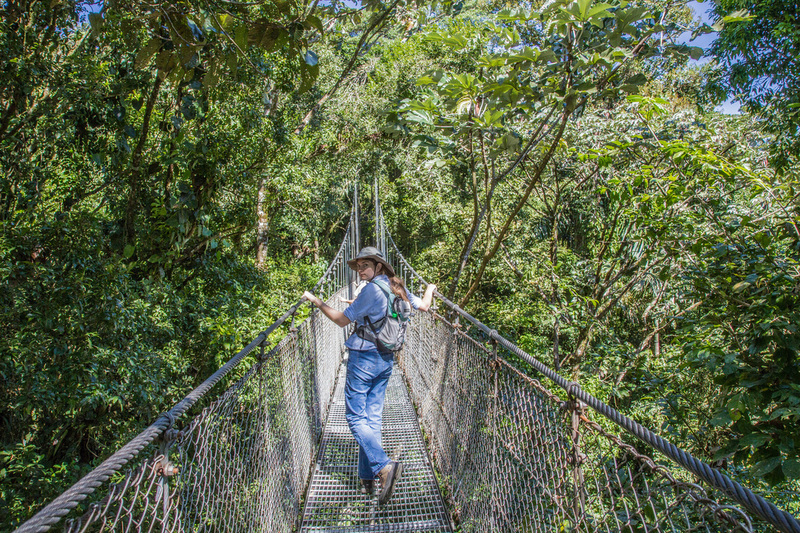 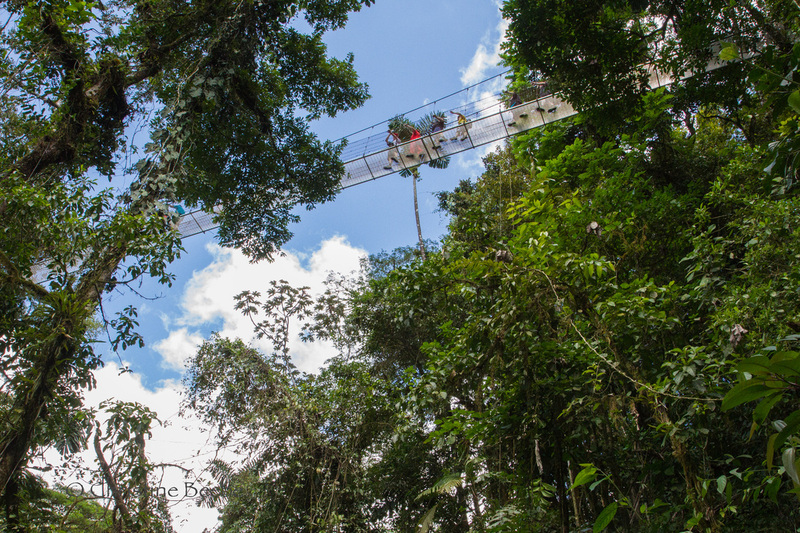 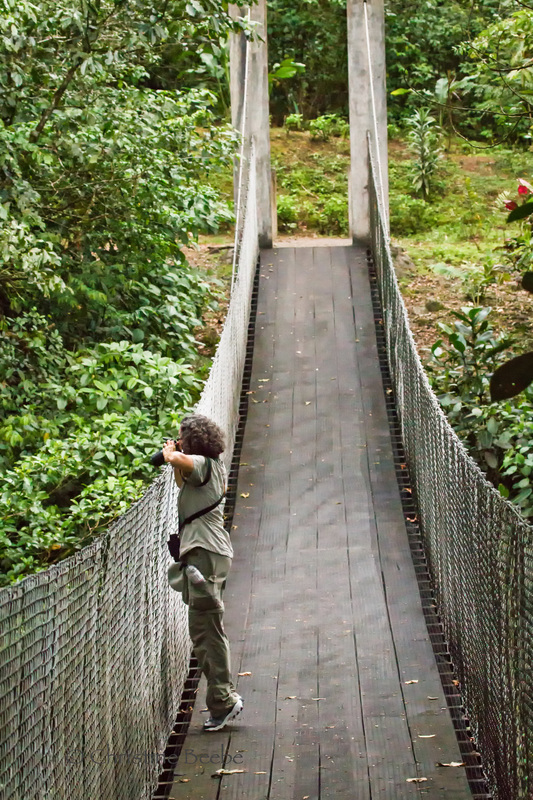 We also visited Arenal Hanging Bridges, situated in a glorious primary rainforest with 15 suspension bridges that take you high into the canopy. 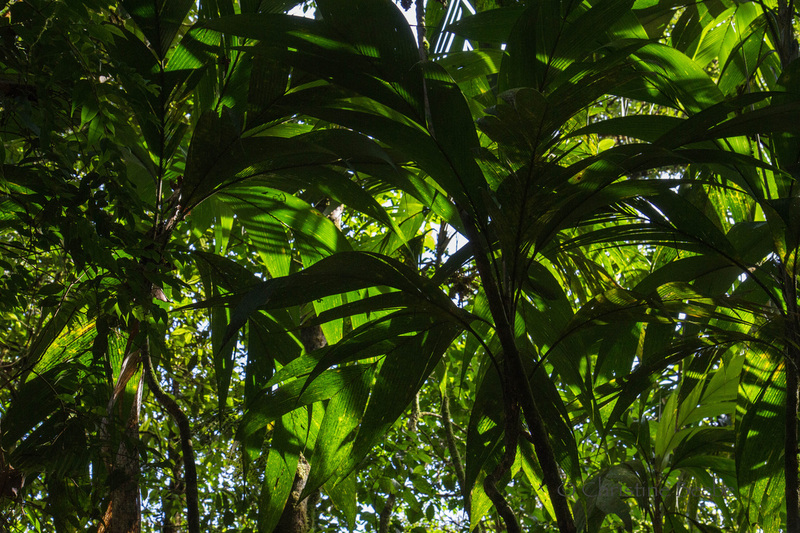 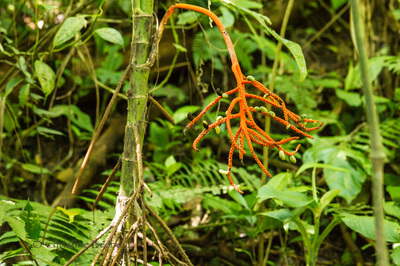 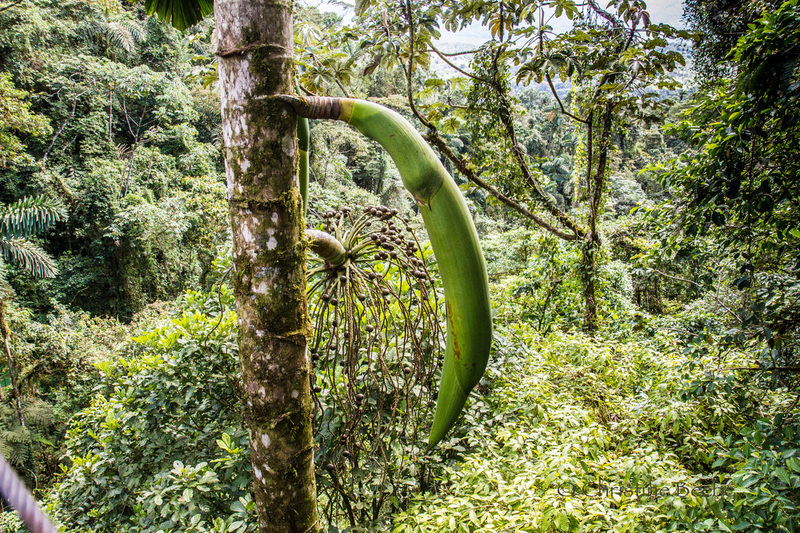 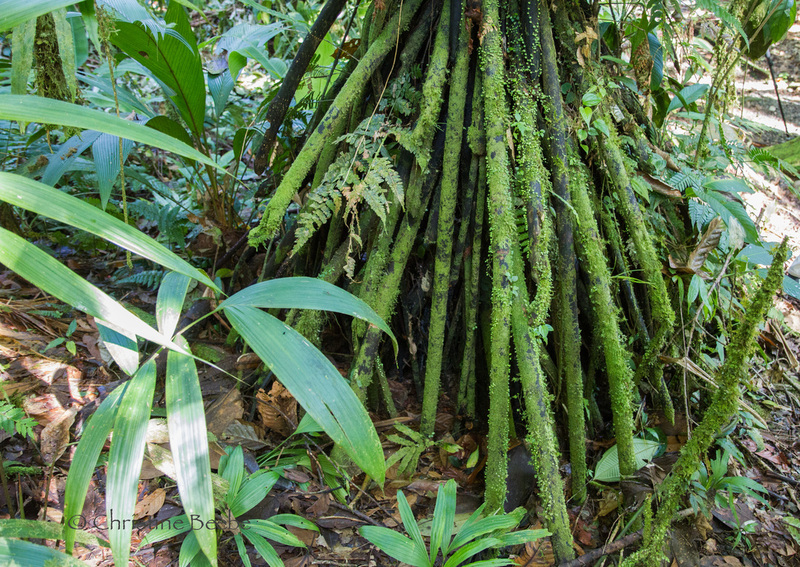 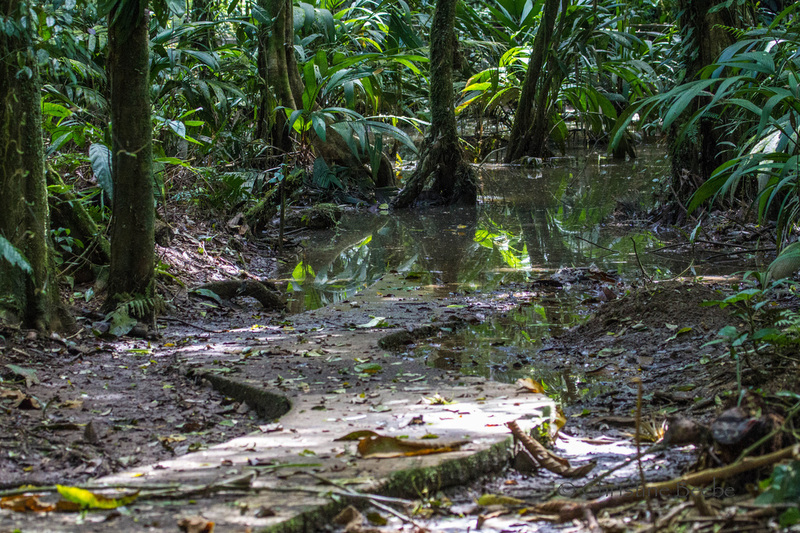 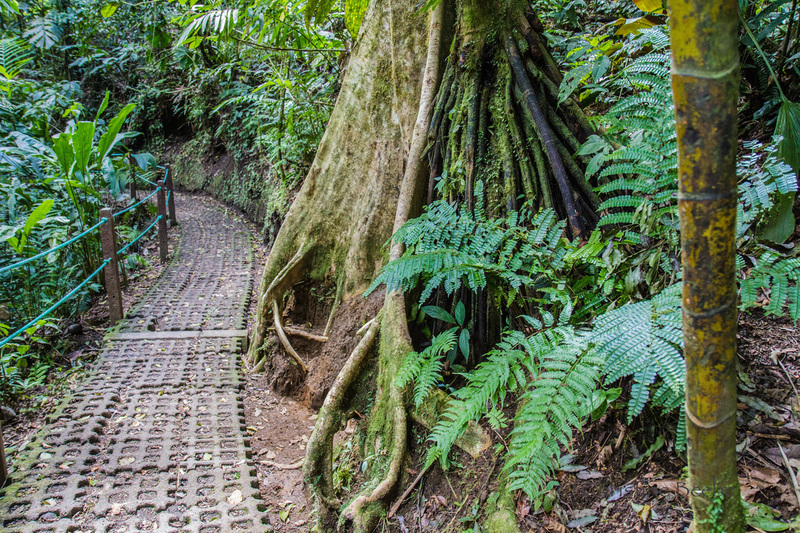 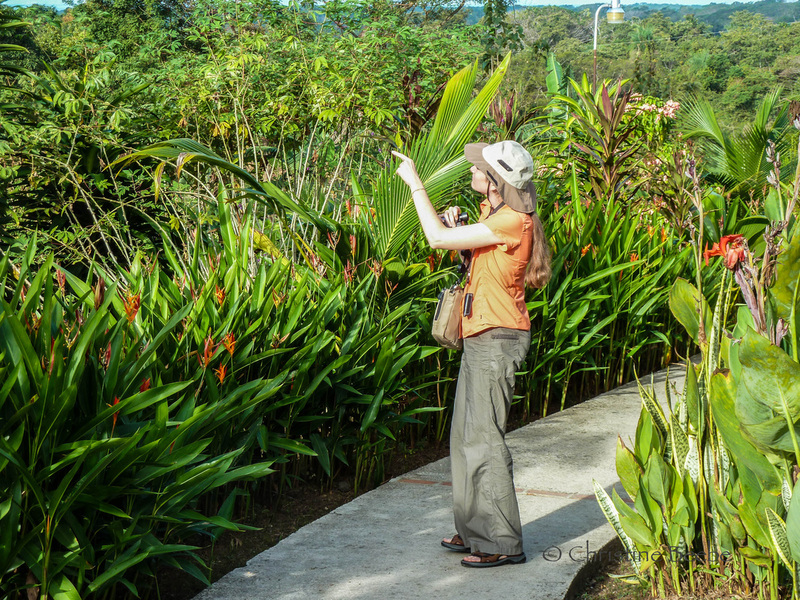 We walked with a guide and learned about the different ecosystems of the rainforest, while observing many exotic plants, trees, mammals, birds, insects, snakes, and howler monkeys, all in a green wonderland of tropical beauty. 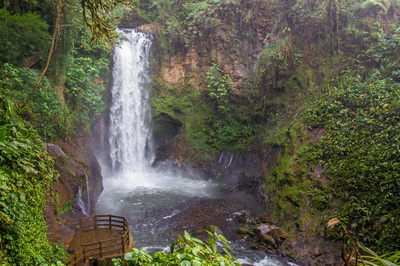 The last days of our trip were spent at a very special destination lodge, on the grounds of the La Paz Waterfall Gardens. This amazing property features five waterfalls, hiking trails, bridges and catwalks traversing the often steep terrain. 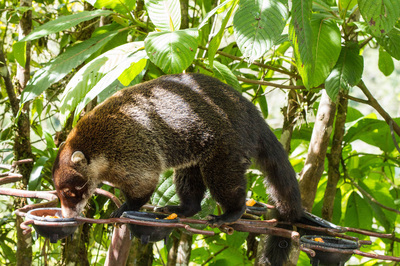 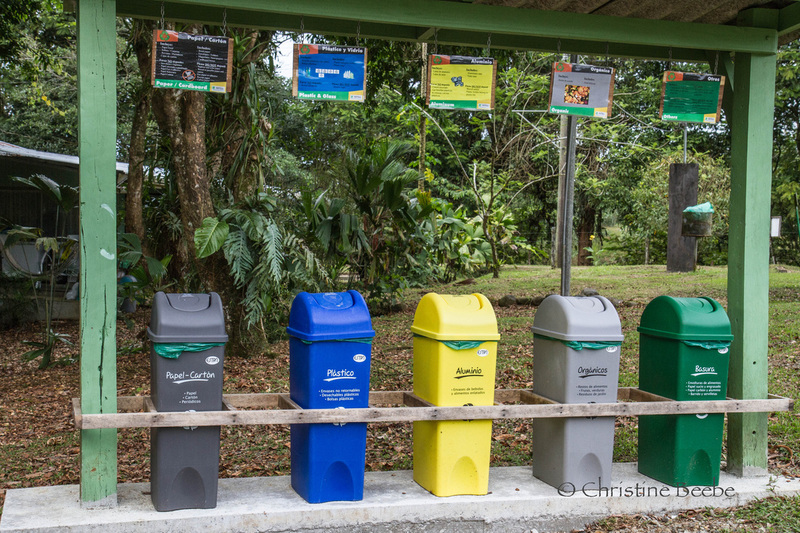 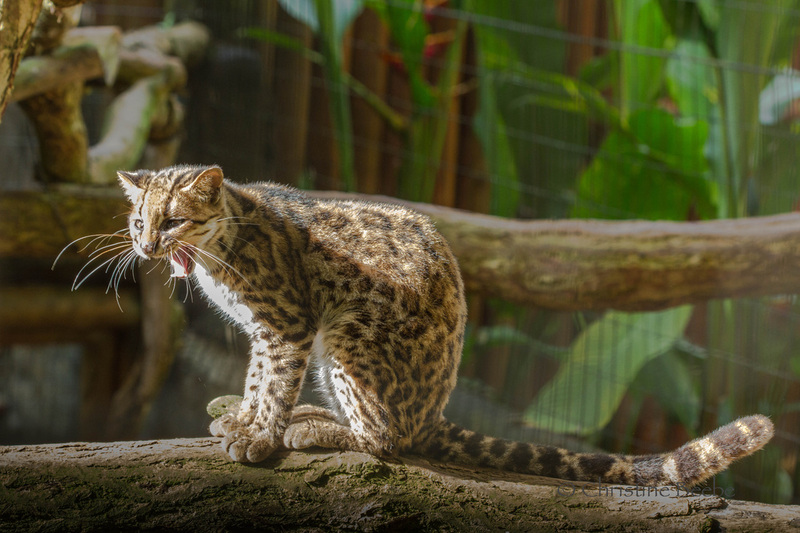 There's a huge aviary with 40 species of birds, rescued Costa Rican mammals including marmoset monkeys, two-toed sloths, Capuchin (white-faced) monkeys, black-handed spider monkeys, Jaguars, pumas, ocelots, jaguarundis and margays. 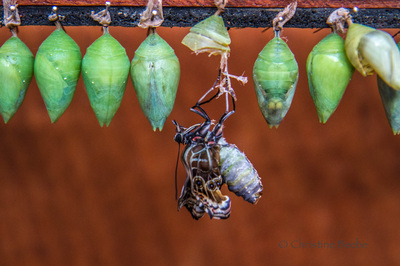 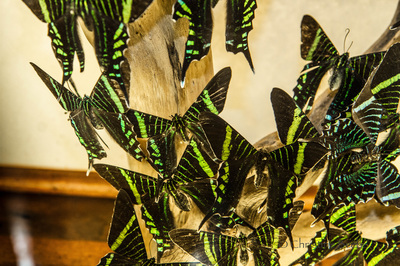 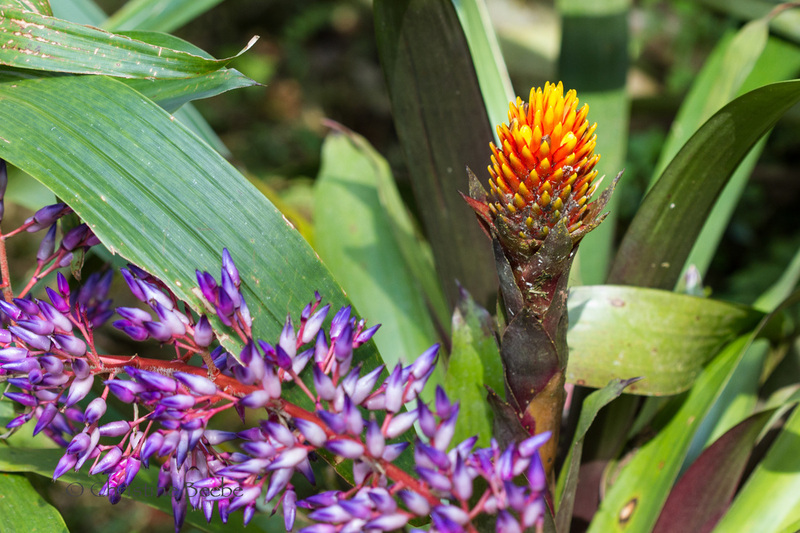 There are stunning gardens of orchids, heliconias and bromeliads, an insect exhibit, and a butterfly observatory featuring psychedelic Blue Morphos. You can hand-feed exotic wild hummingbirds twice a day. 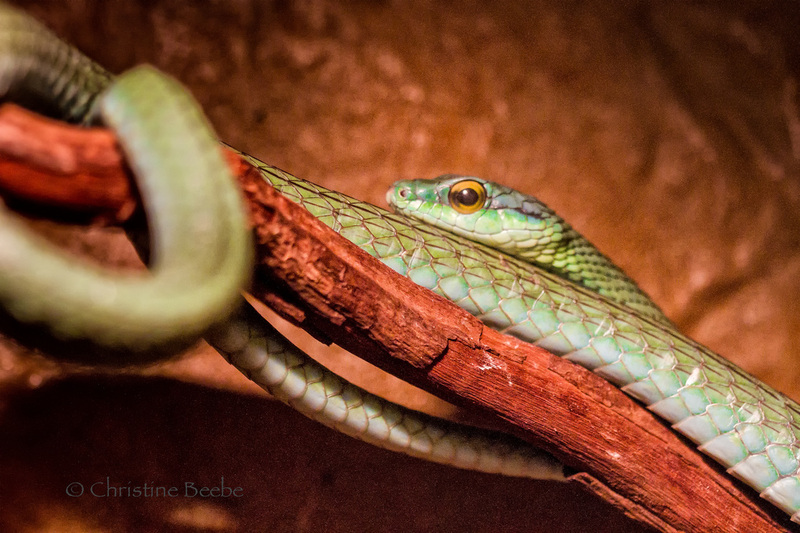 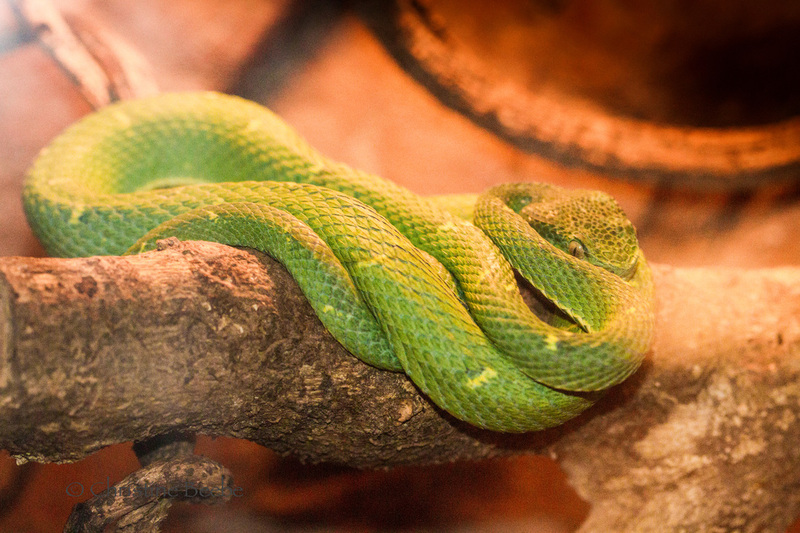 There's a Serpentarium featuring 30 of the most beautiful and deadly snakes in Costa Rica. 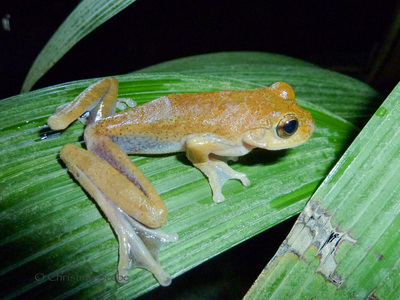 And lastly, there's a "Ranarium" (frog exhibit), which you must enter with a guide at night because they're nocturnal. 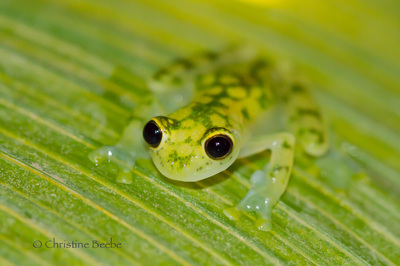 He illuminates these tiny colorful creatures with his flashlight, and because they're free to roam (hop), they are also free to plop onto your head. 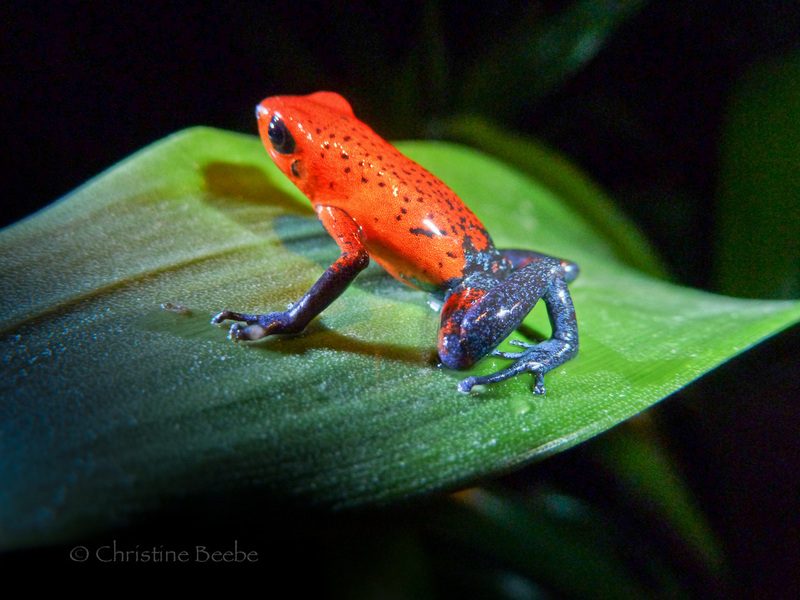 Some of the frogs are Poison Dart Frogs, and our guide cautioned that if we happened to touch one, we shouldn't then touch our eyes or mouth - because their poison is on their skin. but my photos of the hummingbirds, snakes, frogs and flora we saw there are included in previous sections. The Costa Rican tour company we used, Tropical Feathers, did an excellent job with the birdwatching portion of this trip. Our guide Noel Urena (who owns the company) pre-arranged all our accommodations, transportation, and activities, according to the group's specific preferences. 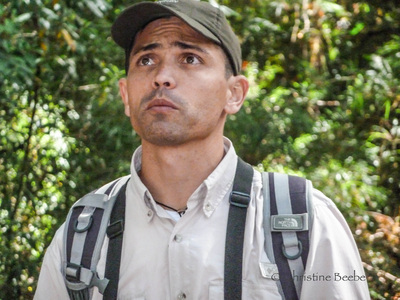 He's a well-educated and passionate birder, excellent photographer, and has a witty sense of humor (ask him to call you on his banana phone when you're on the road with him). 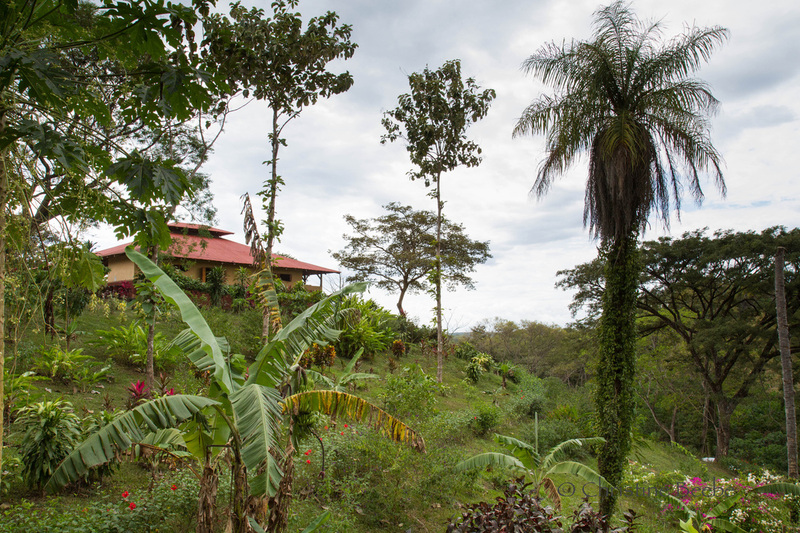 He even took us to his home one afternoon, and made sure everyone's needs were met throughout the trip. 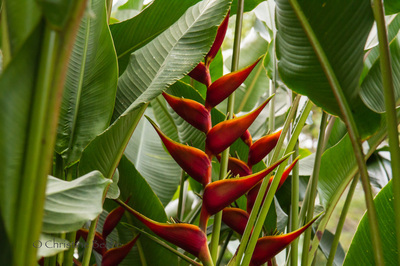 We were transported to all our destinations in a very comfortable modern van with a helpful and considerate driver. 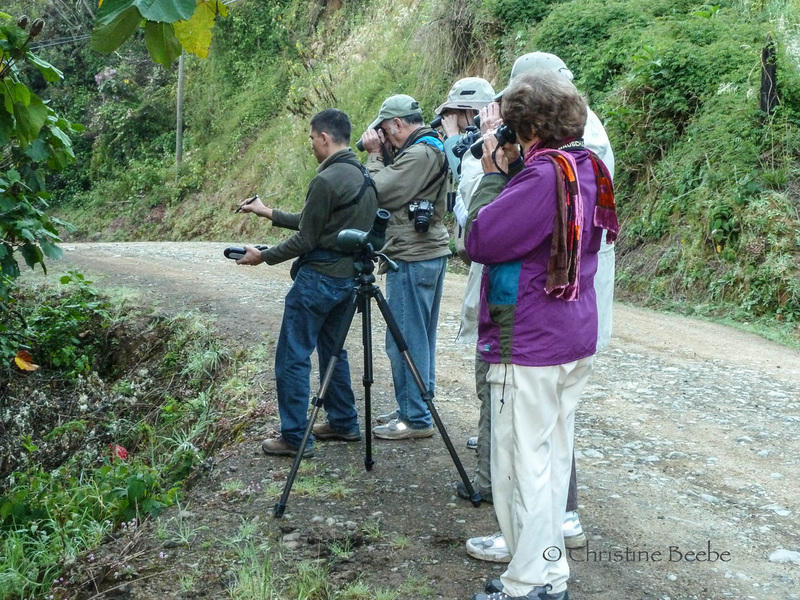 Our days while on the tour were mostly devoted to birdwatching, which meant that our lodging was chosen for it's location near or in birding hot spots. 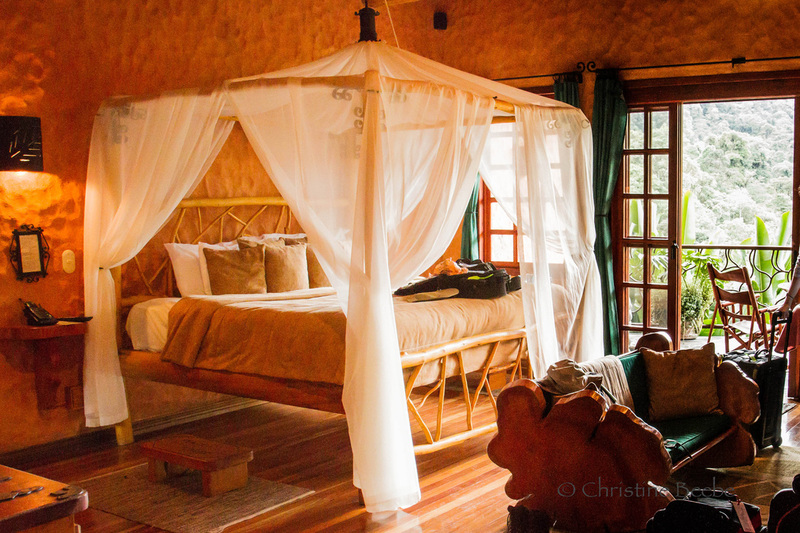 While comfortable for the most part, some of our accommodations were quite basic and/or rustic in order to keep costs down and also to immerse us in nature. 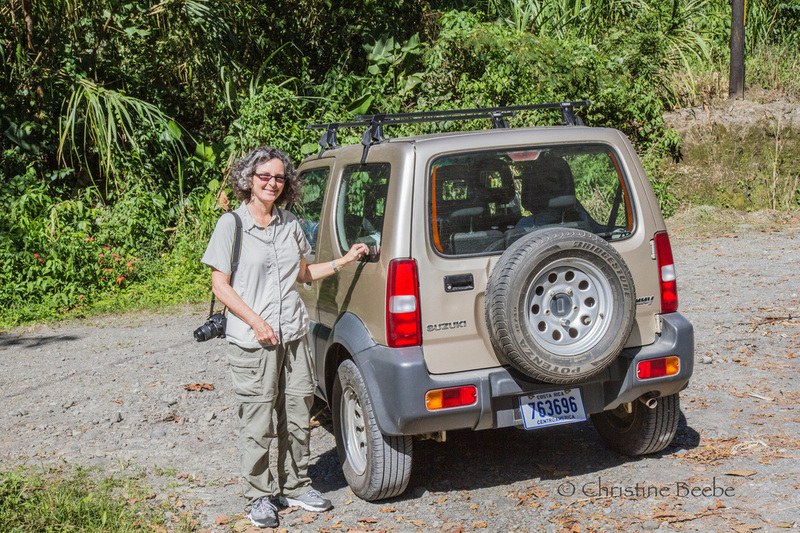 On the 10th day of our trip, Jess, Julie and I left the birdwatching group and headed out on our own to explore two destinations that proved to be the highlights for me: Arenal Volcano National Park (which we explored with our own rental 4x4), and La Paz Waterfall Gardens and Peace Lodge. La Selva Biological Station, Parque Nacional Braulia Carrillo. 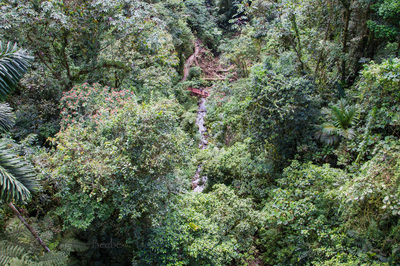 La Paz Waterfall Gardens area. 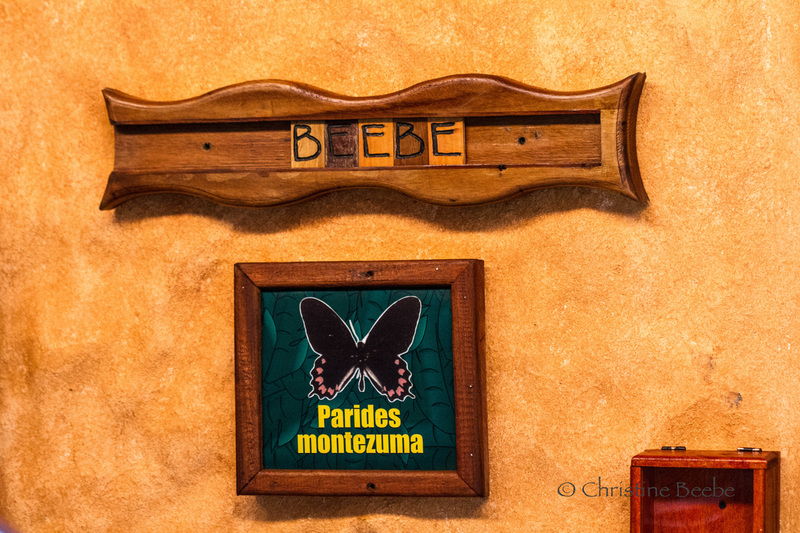 The Hotel Bougainvillea in the capital of San Jose was the perfect spot to begin our trip, with very comfortable rooms and delicious local food. 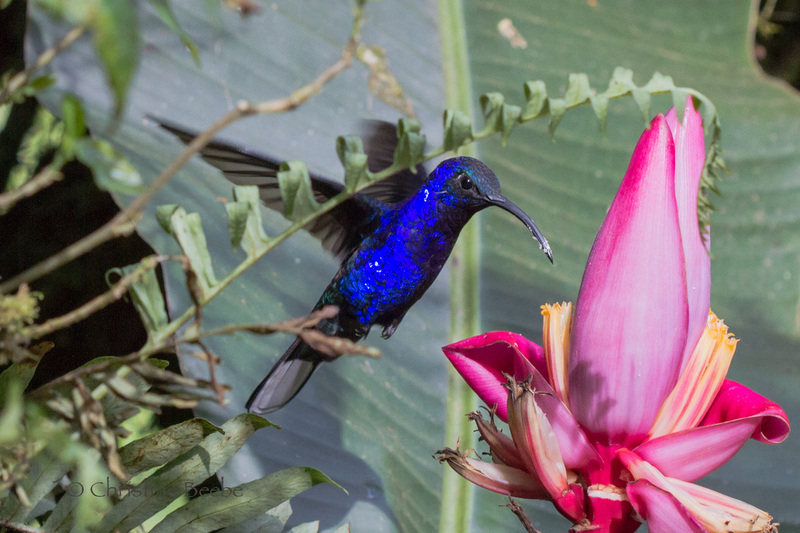 Wandering the hotel's tropical gardens with many colorful birds was a good taste of what was to follow. 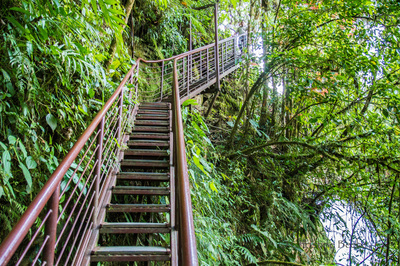 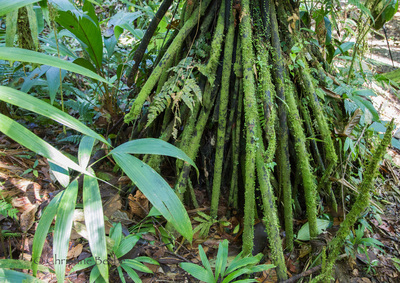 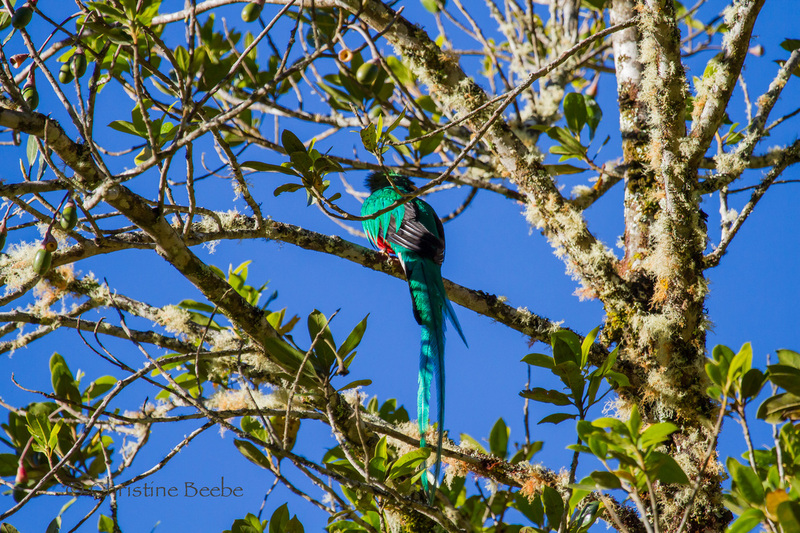 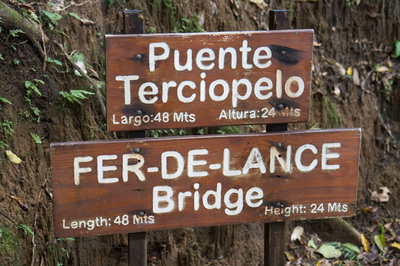 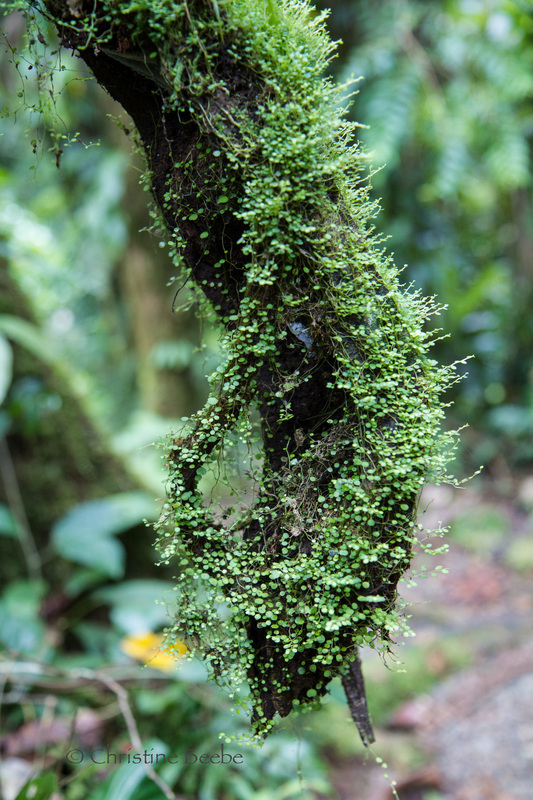 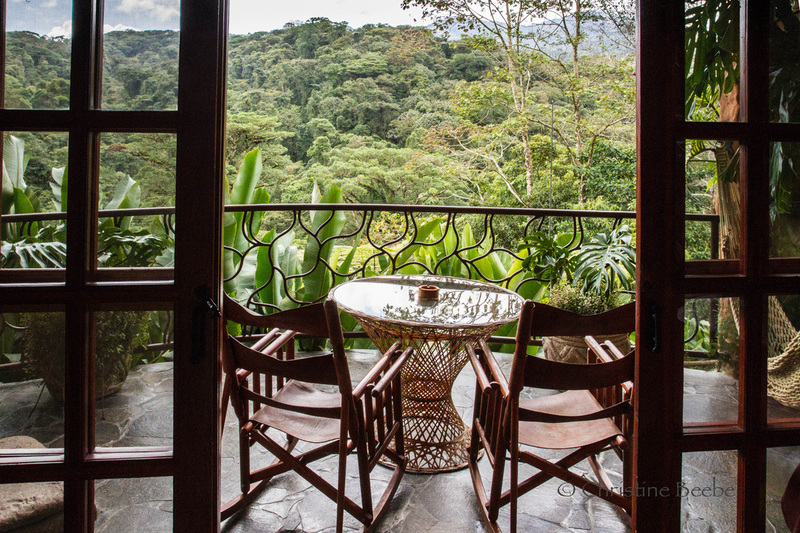 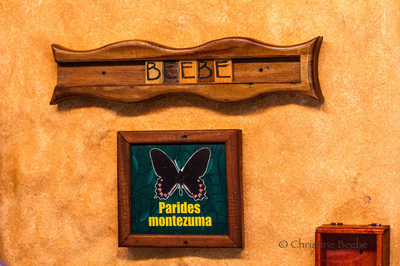 Savegre Mountain Lodge is in the cool cloud forests of San Gerardo de Dota, near the home of the Resplendent Quetzal. 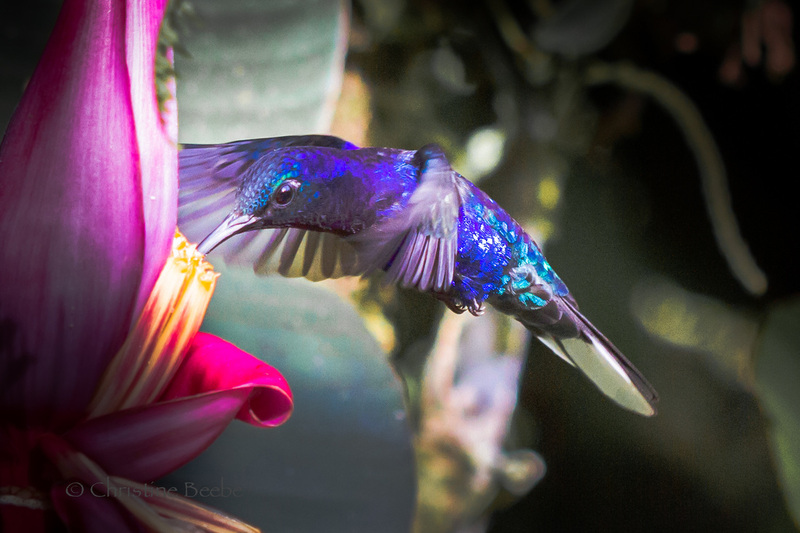 The beautiful grounds were overrun with vibrant flowers and brilliantly-colored birds. Hummingbirds zipped between feeders on the patio, posing (just for a nanosecond) for photographs. 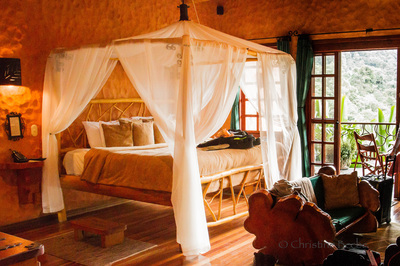 Rooms were rustic but comfortable, and with an on-site spa and nature trails, it was a nice place to stay. 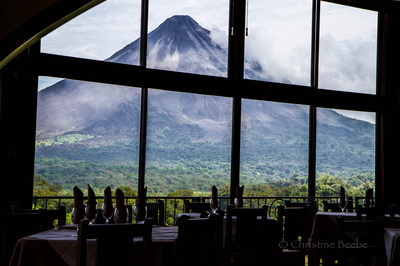 Hotel Linda Vista is in a gorgeous setting within Arenal Volcano National Park. 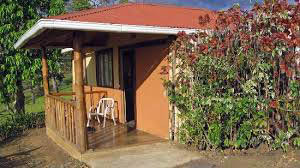 More of a lodge than a hotel, it's situated several miles from the town of La Fortuna, down a long and bumpy dirt road. 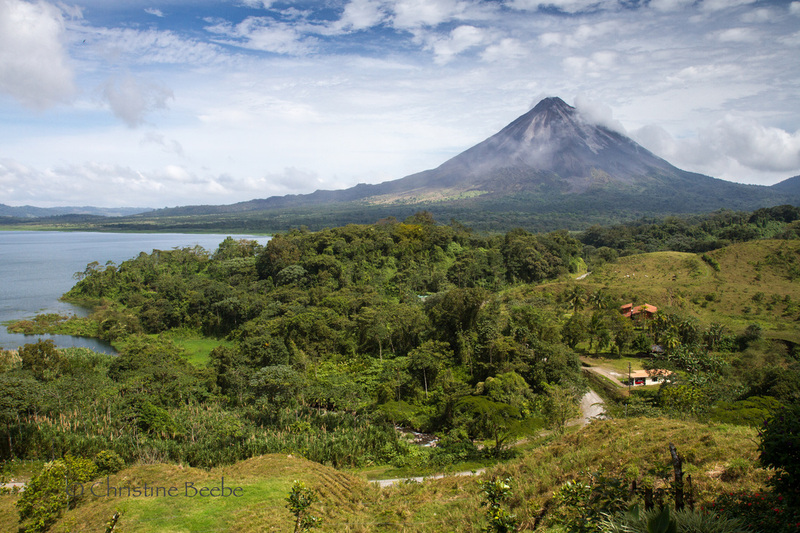 But the grueling ride to get there is rewarded with breathtaking views of Arenal Volcano and lake Arenal from our guest room and the restaurant. Cerro Lodge is a cluster of rustic bungalows arranged along a hillside. My favorite feature was our "private" bathroom: when we opened its door, we found ourselves outside! Yes, it was mostly enclosed by a bamboo fence, shrubbery, and a partial roof over the toilet, but when Nature called, we truly experienced Mother Nature! 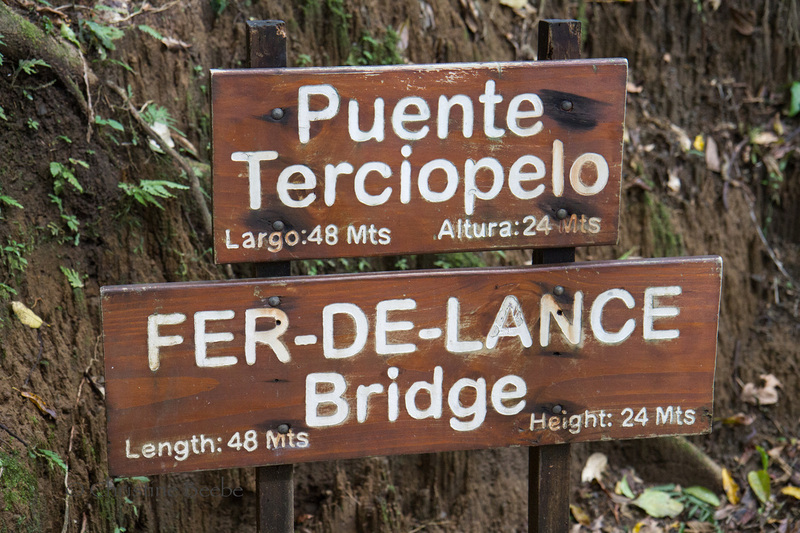 Fortunately, we encountered few mosquitos during this January trip. Meals were served al fresco on a broad covered patio. 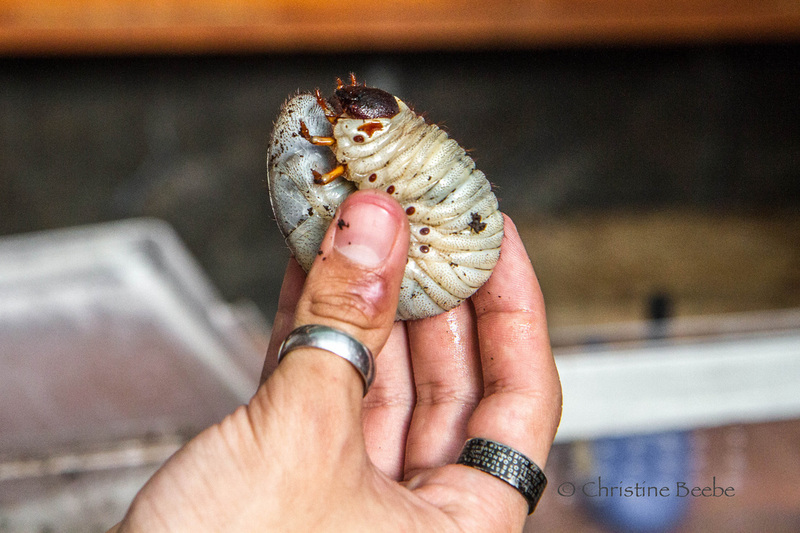 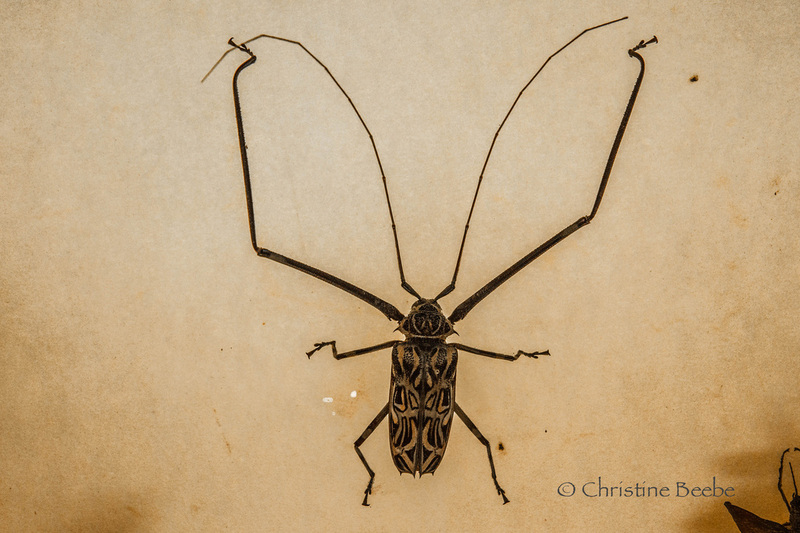 We stayed 3 nights at La Selva Biological Station, a research site run by the Organization for Tropical Studies (OTS). 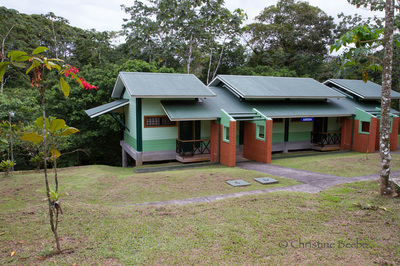 University students and scientists come from around the world to study the unique flora and fauna here, and we stayed in the same rooms they use, mostly clean but spartan with hard cots, small scratchy towels, no air conditioning and dim lighting. 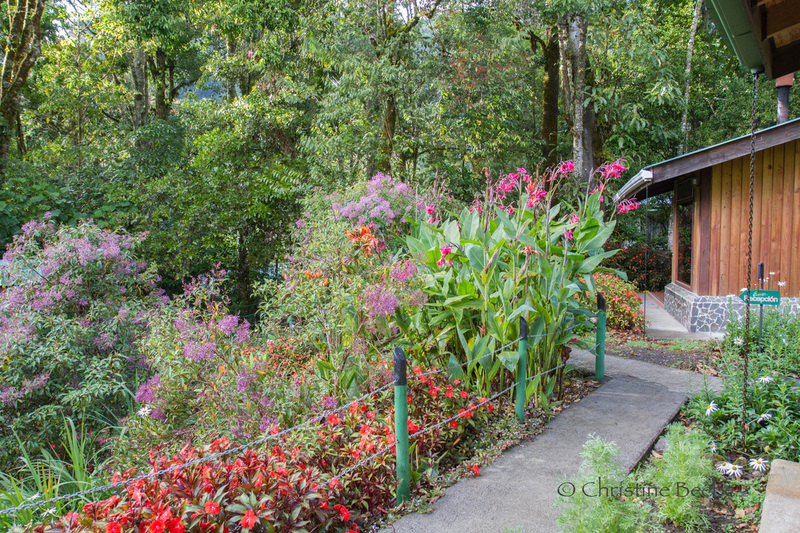 Meals were simple buffet-style affairs, shared with others at picnic tables on an open-air verandah. 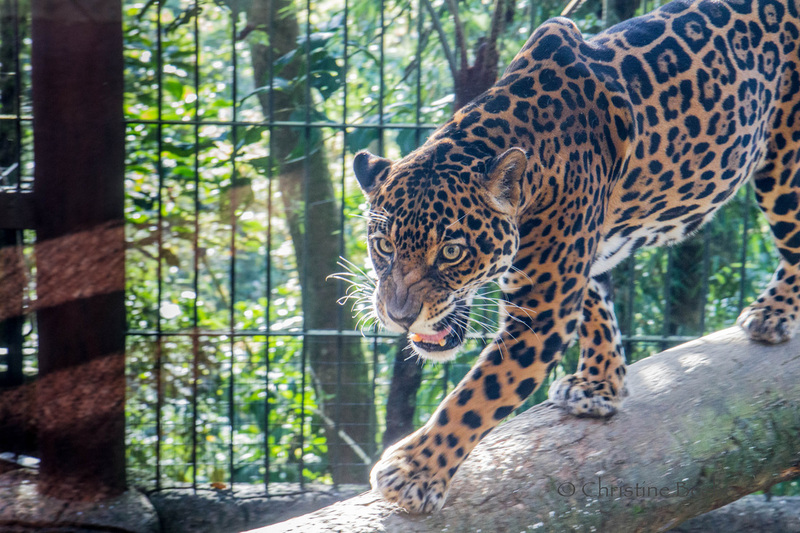 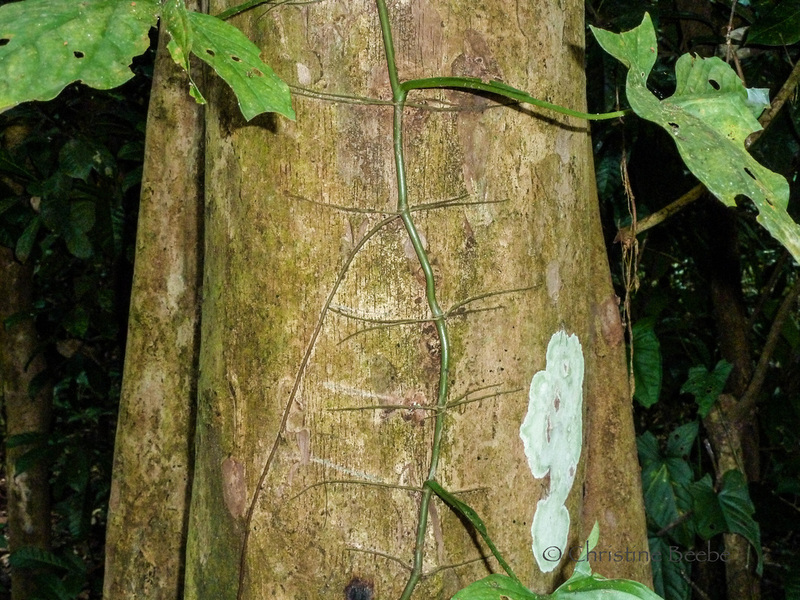 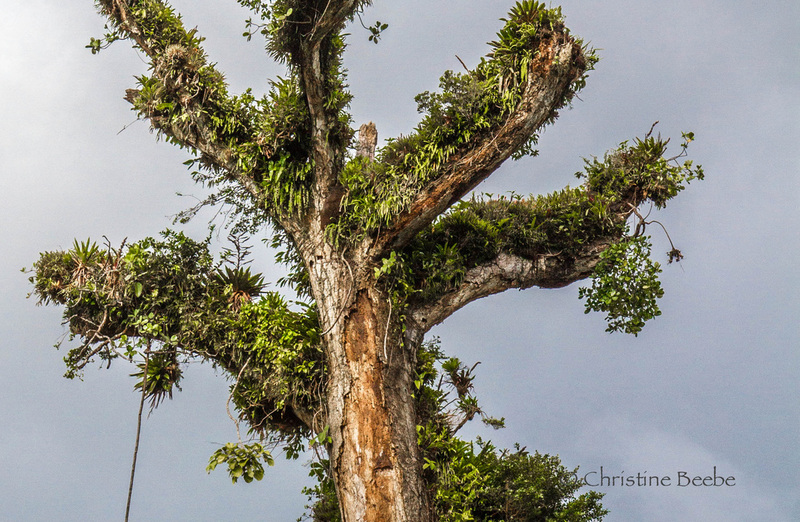 But La Selva is a special place, with 1,000 tree species, 420 bird species, and half of all mammals in the country. 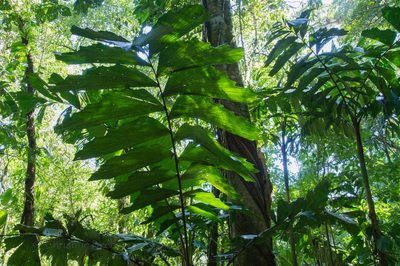 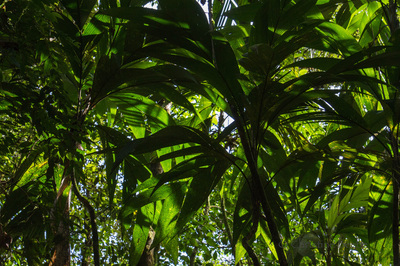 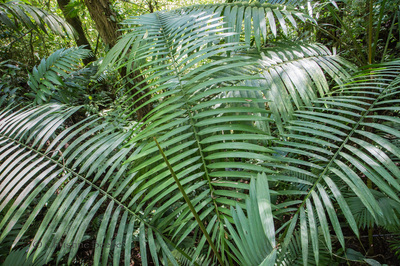 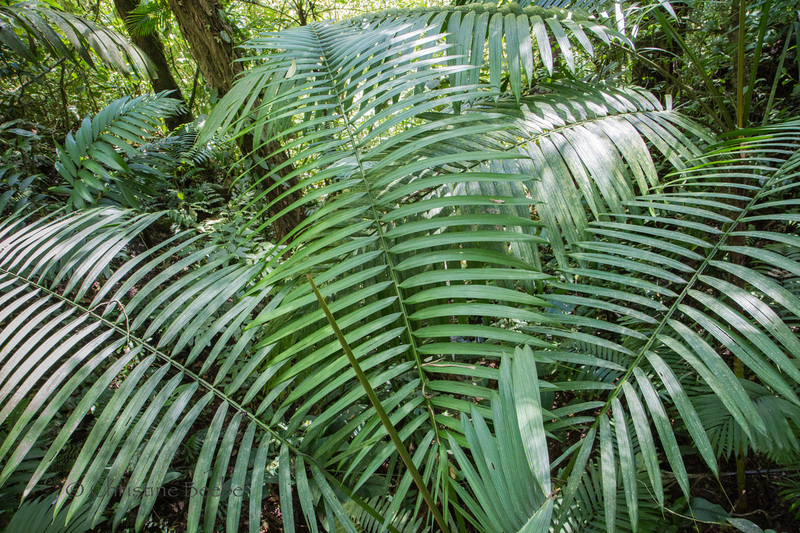 Established in 1954, it's 3,700 acres of "Primary Rainforest," still in its original condition and almost completely untouched by human activities. As more forests are destroyed worldwide, it's reassuring to know that Costa Rica is protecting areas like this in perpetuity. 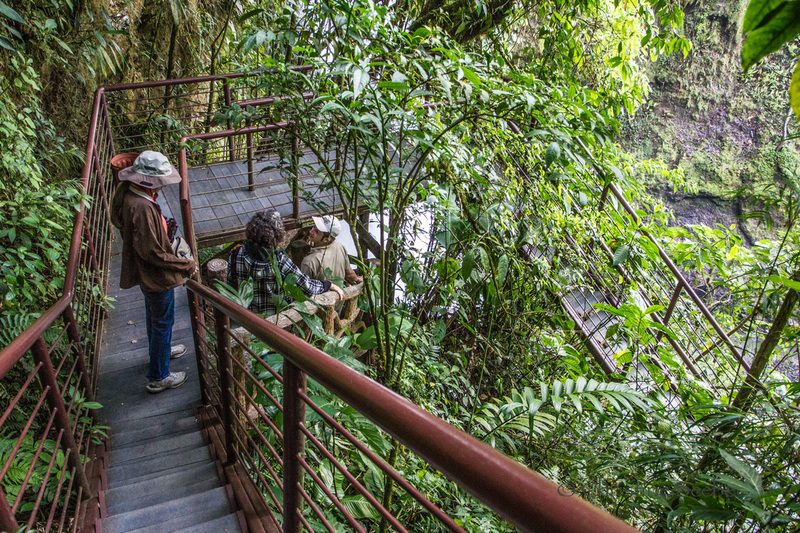 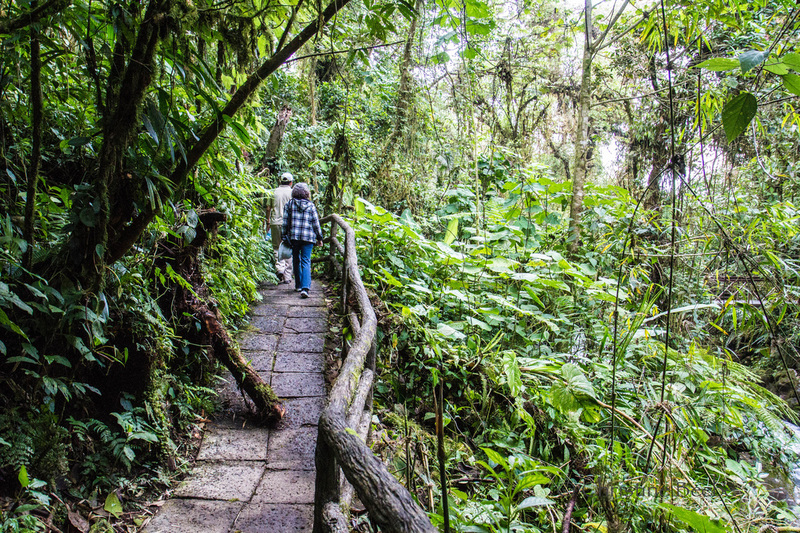 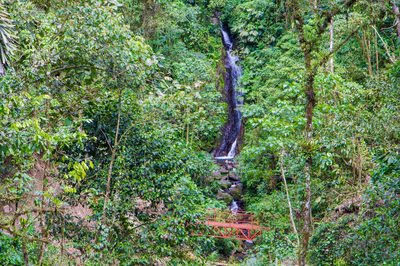 The La Paz Waterfall Gardens and Peace Lodge are located at 5,000 feet on the slope of the Poás Volcano, on the Caribbean side of the Continental Divide. 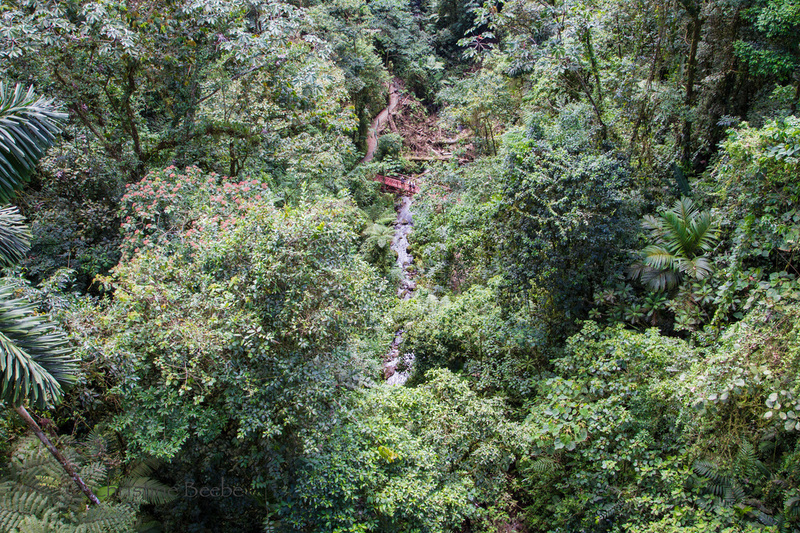 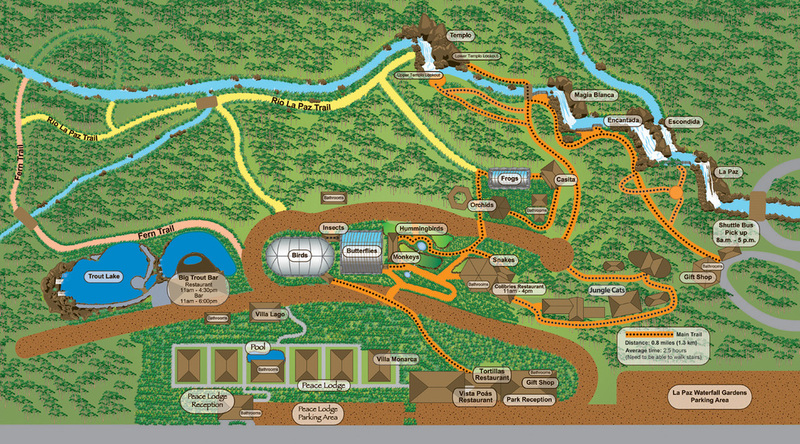 Due to the elevation, it's both rain forest and cloud forest. It's remote here, and access is via a long windy road that's frequently rendered impassible due to landslides. 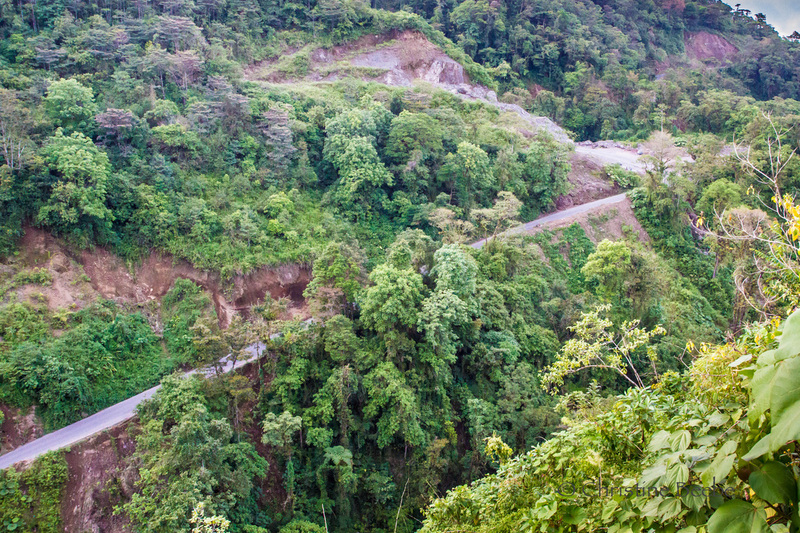 The road was first constructed by the U.S. Army Corps of Engineers during World War II, shortly after the Japanese invaded Indonesia and threatened to cut off the world’s supply of quinine from its quinine farms. 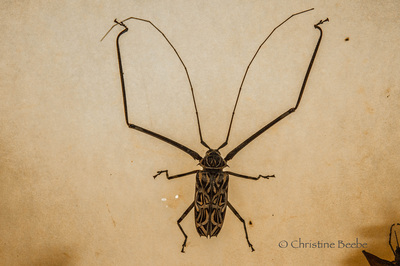 At the time, quinine was the only effective cure for malaria, a disease then rampant in the South Pacific. 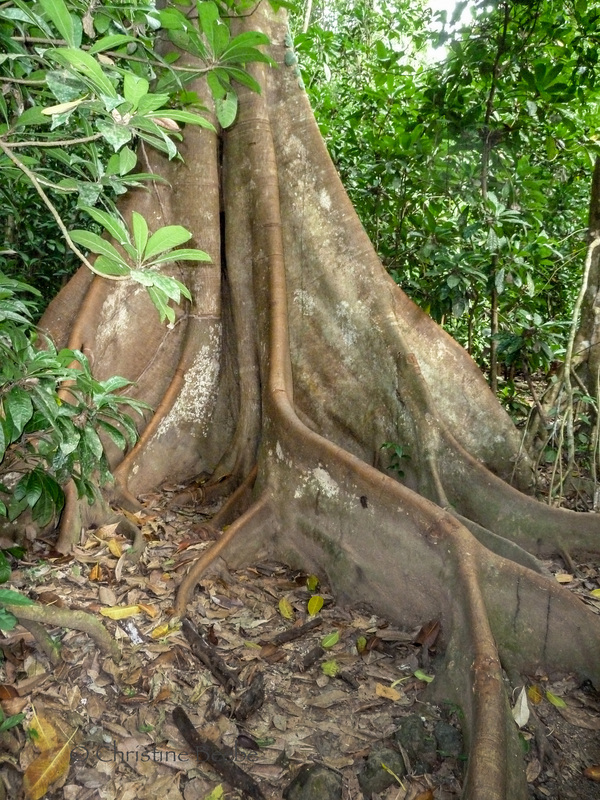 Quinine is extracted from the bark of the cinchona tree and since there were many of these trees growing near the site of where the Peace Lodge now stands, Costa Rica agreed to let the US harvest quinine in exchange for the road (see photo below). 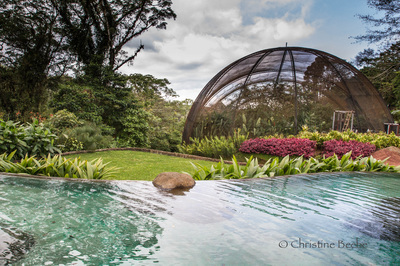 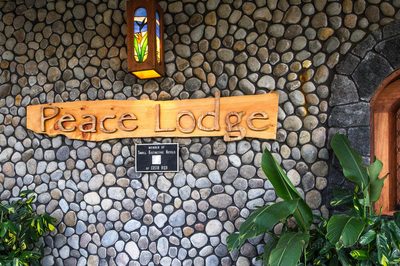 The Peace Lodge was enchanting, a true paradise and the perfect place for us to spend our last two nights in Costa Rica. 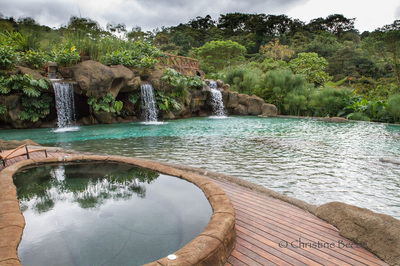 This award-winning upscale lodge is called "one of the seven natural wonders of Costa Rica,” and has been featured on the Discovery Channel, Animal Planet and over twenty International travel and nature programs. 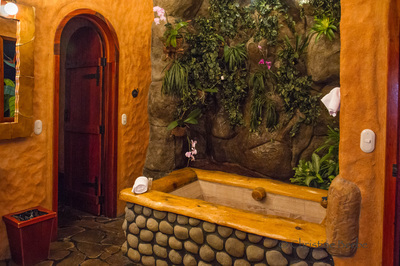 Rooms are decorated with a unique rainforest theme that includes river rock fireplaces, original art and stained glass, hand carved wooden furniture, canopy beds, and incredible bathrooms with waterfall showers that flow down over a wall of live plants. Large balconies with rocking chairs and hammocks look out over the La Paz River Valley. 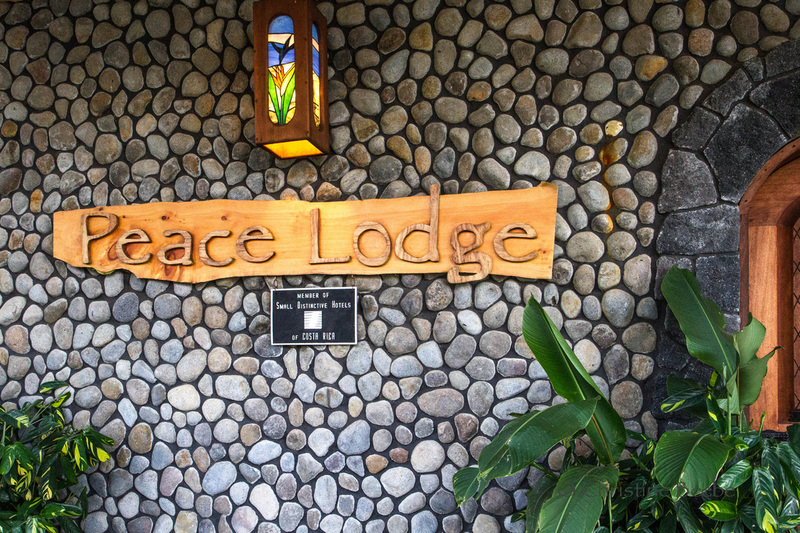 The lodge features two excellent restaurants serving gourmet Costa Rican specialities, a lounge, and a poolside bar.